It’s Ethan Juan and Yang Mi’s latest drama, Legend of Fuyao. We started this drama a month ago, clicking into the drama for Ethan Juan more than for Yang Mi. 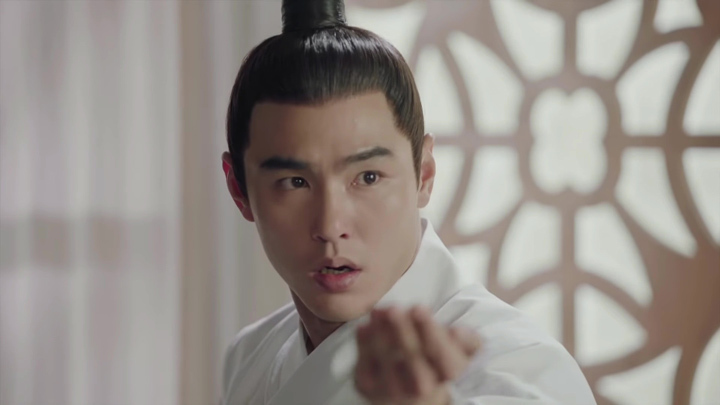 We’re not huge followers of Ethan Juan’s dramas, but having only seen him in modern-setting Taiwanese dramas, seeing him in a Chinese historical drama had us curious enough to want to see his latest project. 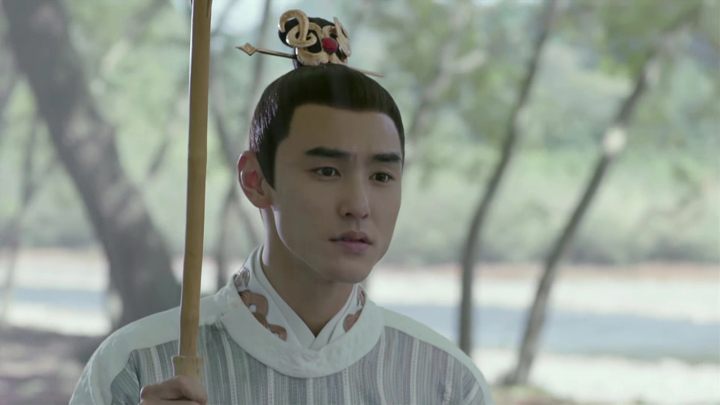 But, Ethan Juan isn’t the only reason we started watching Legend of Fuyao. 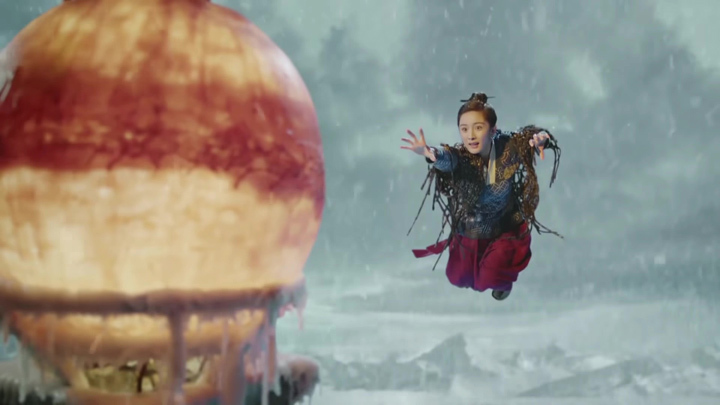 Over the past year, we’ve developed a growing liking towards Chinese historical dramas as well as Chinese fantasy dramas. 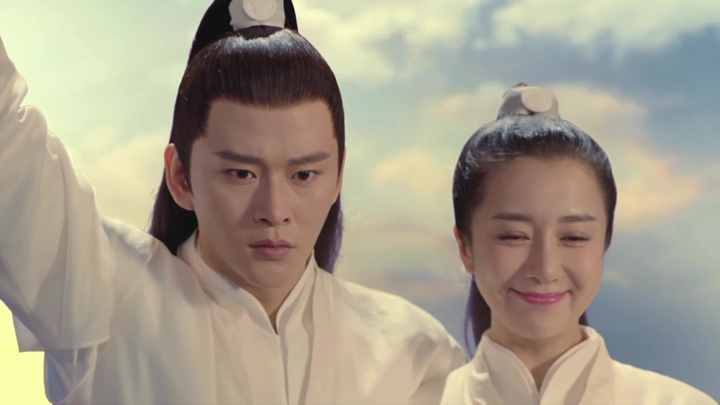 We’re still getting into the wide selection of these kinds of dramas, but we found dramas like Flame’s Daughter and Untouchable Lovers super awesome. So, we were in for finding another Chinese historical drama that will keep us clicking episode after episode. And so, here we are, watching Legend of Fuyao with a reserved level of hope that this will be a good watch. Despite having started this drama a month ago, we haven’t managed to get far into the story with us fitting this in between other dramas. We’re still at the point of trying to grasp the situation between the kingdoms, who the good guys are, who the bad guys, what each of their true identities are and how it all might fit into the wider scheme of the plot. At times, we found we had to pause and rewind just to make sure we absorbed all the details. And there are a lot of details to absorb in order to keep up with it all. With that said, onto introducing Legend of Fuyao story set-up, the characters, the character relationships, kingdoms, clan and different clan sections. 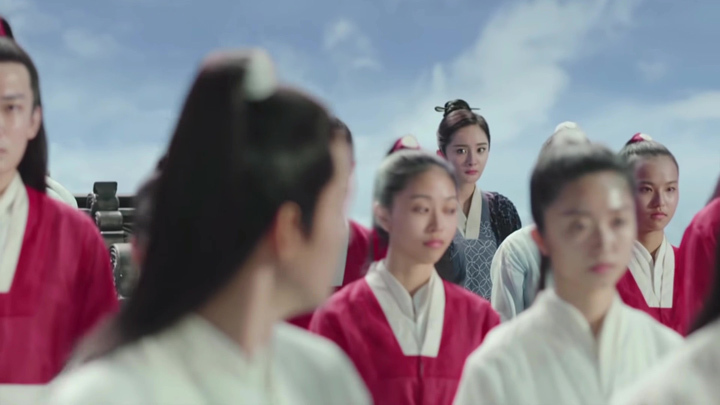 We find that with Chinese historical dramas, the first episode normally gets up to introducing the characters and not a lot of the main story, so this will be a recap which spans the first five episodes. “Do you know how the five kingdoms became the five kingdoms of today? The present Tianquan received an appointment from Holy Land of Firmament to rule over Taiyuan, Xuanji, Tiansha Three-Kingdoms. There is peace and prosperity in the country. “But a thousand years ago, Di Feitian ordered the massacre of the five kingdoms. The people plunged into an abyss of misery. 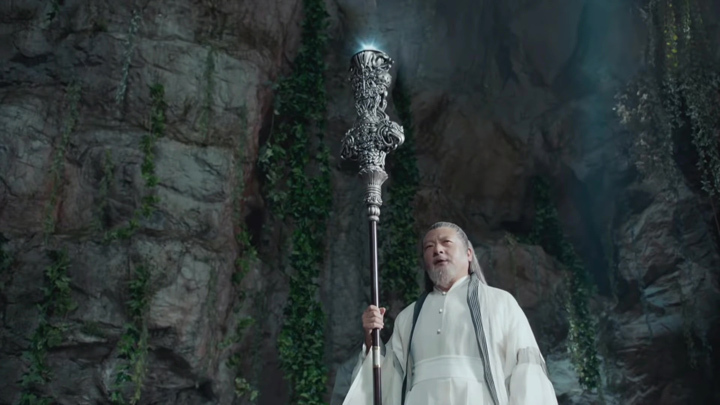 The Elder of Firmament, Zhang Qingzi, used Xuanling Zhen Ye (mysterious spirit leaf) to reverse the war situation. 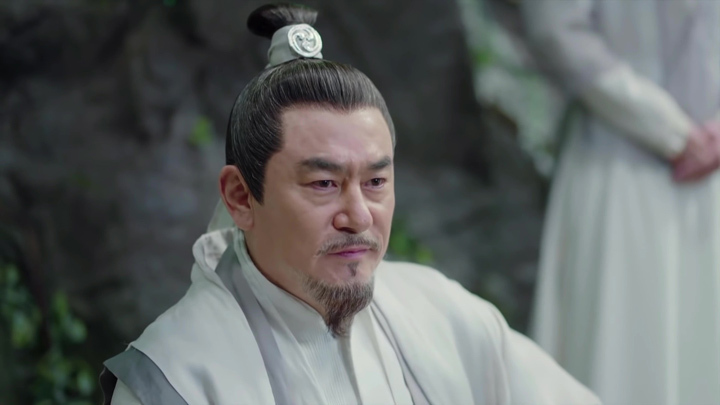 Legend of Fuyao opens with a prologue which has an old white-bearded man (the king of one of the kingdoms possibly) briefing the subject before him the current state of the five kingdoms and the dormant threat to the kingdom’s peace and prosperity. Di Feitian, someone who ordered the massacre of the five kingdoms a thousand years ago lies dormant in the form of coagulated blood inside a stone called the Five-Coloured Stone. Through a girl, this seemingly millennia-old evil will be woken; and it’s up to the chosen one of the Mysterious Spirit Leaf to change the outcome as he is the only one who can save the five kingdoms from eternal damnation. 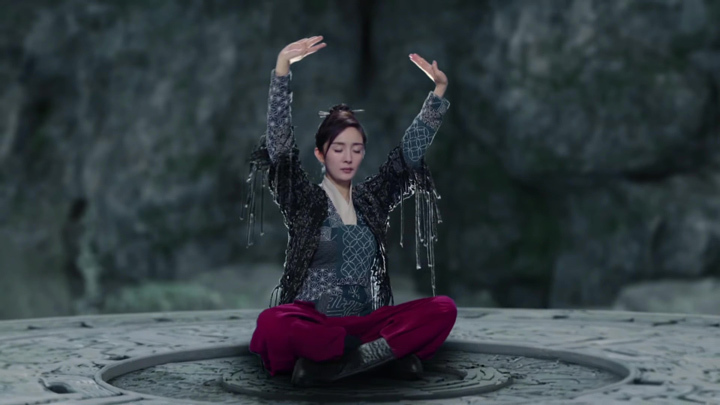 The prologue doesn’t show who this girl is or who the chosen one of the Mysterious Spirit Leaf is, but we’re guessing this girl will be female lead character Fuyao (played by Yang Mi) and the chosen one possibly the male lead character, Zhangsun Wuji (played by Ethan Juan). 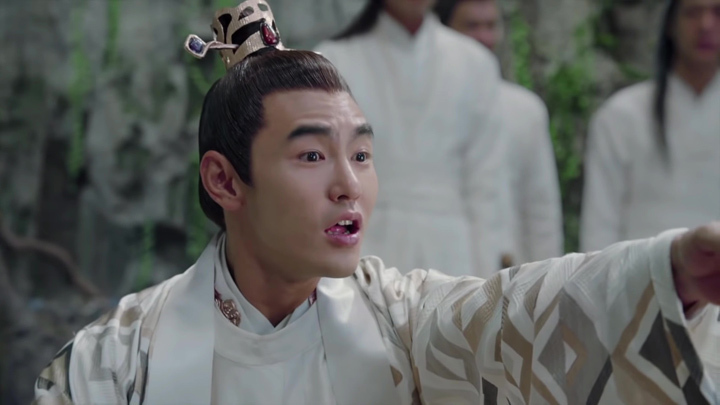 Legend of Fuyao heads into a few character introductions of some of the main characters, Fuyao, Pei Yuan and Yan Jingchen, before moving on to Xuanyou butler, Uncle Zhou, who introduces the Xuanyuan clan and the class differences that exist within the clan. We get a hint of a love triangle made up of Fuyao, Jingchen and Pei Yuan, too. 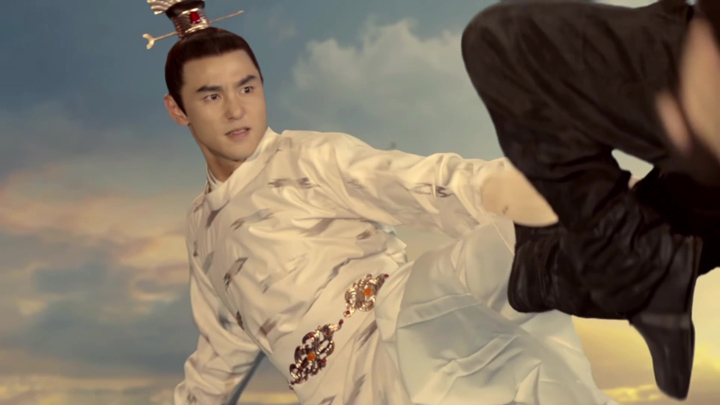 To start, Fuyao, an audacious, lowly servant of the Xuanyou Section with some pretty impressive martial arts skills. 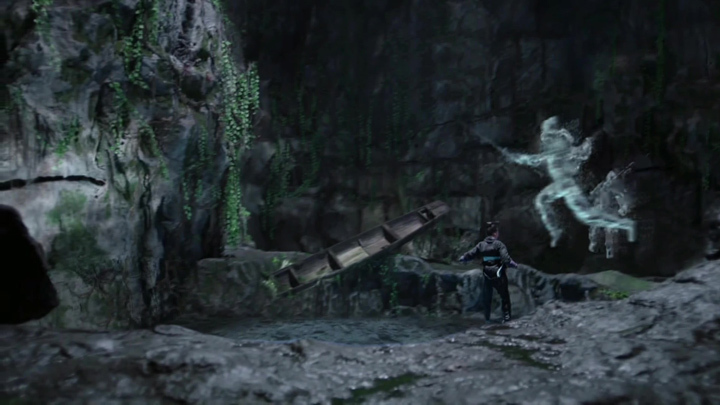 Her introduction sees her in the Xuanyuan secret training chamber against multiple ice warriors attempting to beat the third level and obtain the seal behind him. She almost gets to the seal when she is abruptly pulled out of the training chamber by Pei Yuan (Li Yixiao) and her servant. As a servant, she’s not permitted to learn martial arts. Only those in Xuanyuan clan, those of noble status can learn martial arts. 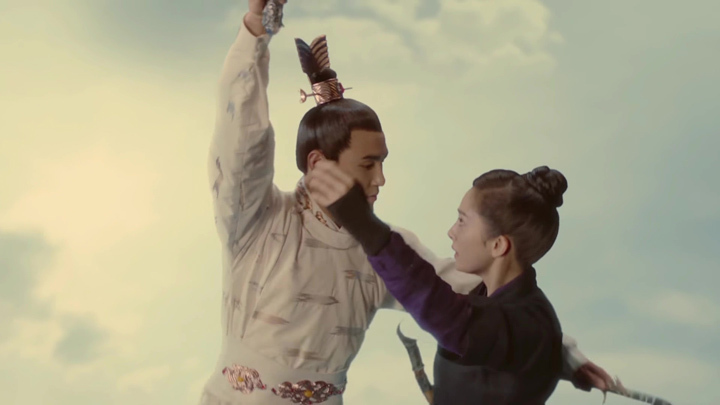 Fuyao’s skills are learned through Yan Jinchen (Huang Youming). 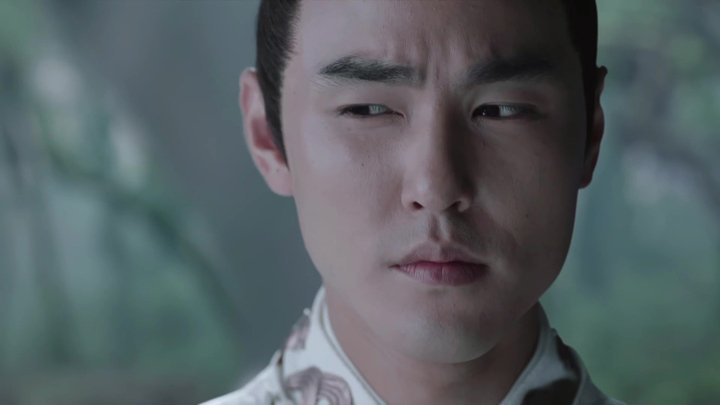 Yan Jinchen makes his appearance down below the mountain where Fuyao escapes to after her run in with Pei Yuan. Yan Jinchen is high up in the ranks of the Xuanyuan clan. He is the son of Xuanyuan Clan Master. Despite the difference in social status between he and Fuyao, they have a close, doting-like relationship. He might even like her. 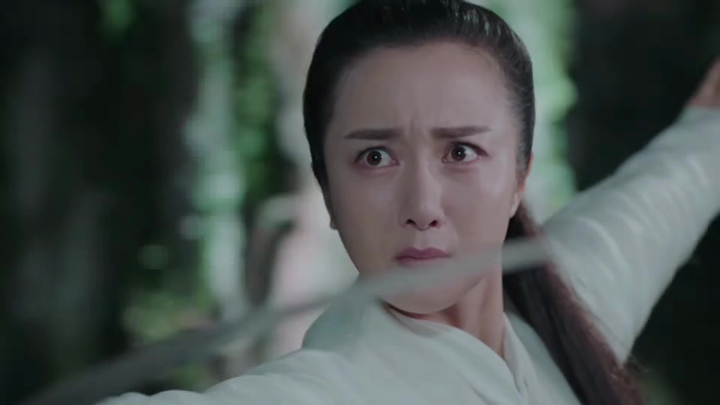 The incident in the secret chamber has Pei Yuan calling for her to be punished for sneaking into the chamber to practice swordsmanship, violating many regulations. Yan Jingchen is a bit surprised to hear this as just moments ago, he thought she went down the mountain because she missed him. To save her from any punishment, he uses her young age as an excuse for going against the regulations: it’s inevitable for young people to be a bit mischievous. 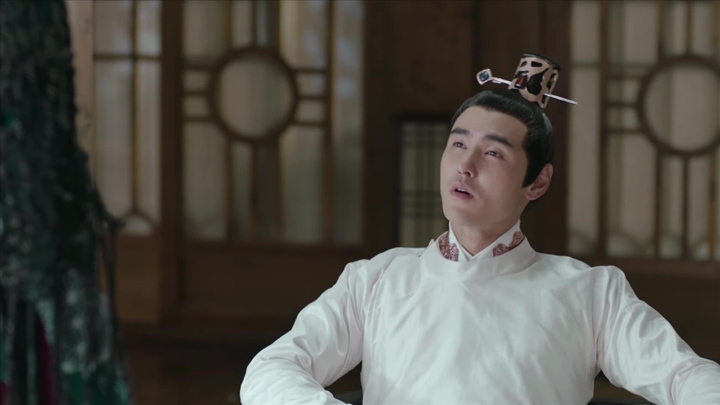 Pei Yuan accuses him of always defending Fuyao leading to a counter argument which has Fuyao point out Pei Yuan’s broke regulations too by not staying up on the mountain for the upcoming Sacrificial Ritual when she should be. (The Sacrificial Ritual takes place just before the opening Hunting Game which we see in later episodes.) 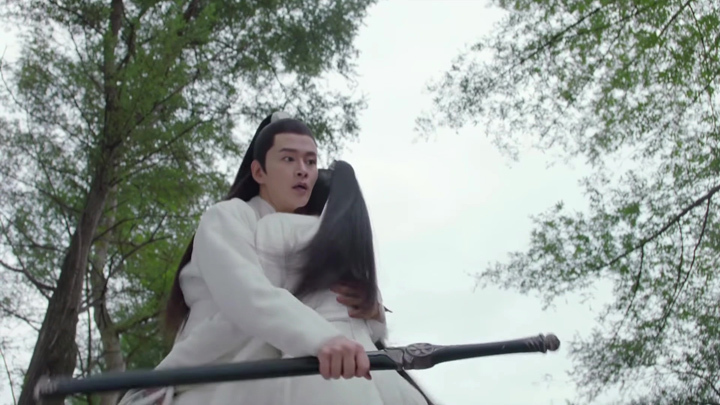 The encounter nearly gets physical with Pei Yuan wanting to slap Fuyao for her insolence. 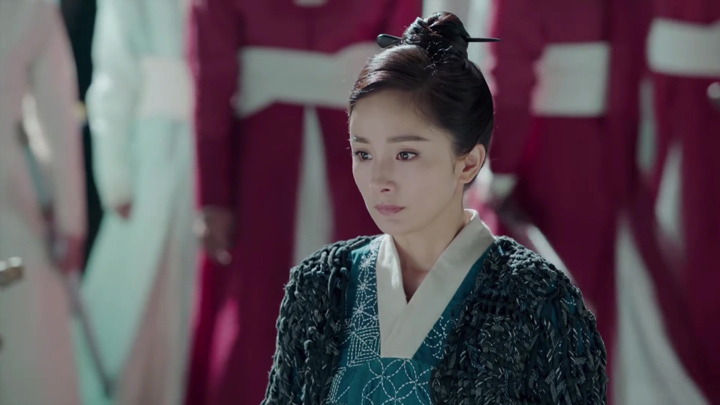 Fortunately, Yan Jingchen steps in, promising to give Fuyao the punishment she is due ending the fight. Yan Jingchen isn’t serious about punishing Fuyao, though. 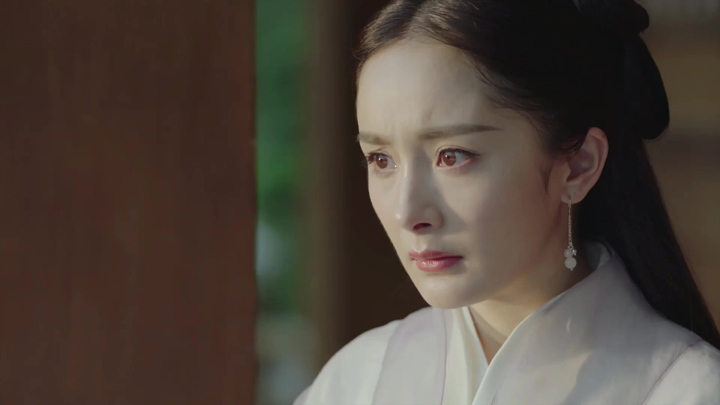 There was a wink of the eye when he told Fuyao to return back to the mountain to reflect and await punishment. Pei Yuan isn’t ignorant. She knows Yan Jingchen was letting her off. This has her try go after her, but she’s stopped by Yan Jingchen, after which she ends up in his arms. Thoughts of going after Fuyao disappear after that. Pei Yuan, a Xuanzheng section disciple and apparently the first female disciple to be accepted into the Xuanzheng section, likes Yan Jingchen. The feelings don’t appear to be mutual as Yan Jingchen separates from her the moment he realises she’s holding on a little too long. Pei Yuan doesn’t denies wanting to stay for the hunting game to earn herself a name, but it’s not only for her sake. It’s for his sake. She wants to make him known throughout Taiyuan Kingdom. Hearing her say this has him gaze at her quite positively. Yan Jingchen’s ambitions – because of power and fame or because of Fuyao? It looks like Yan Jingchen might just be after that same fame, making him and Pei Yuan have something in common. 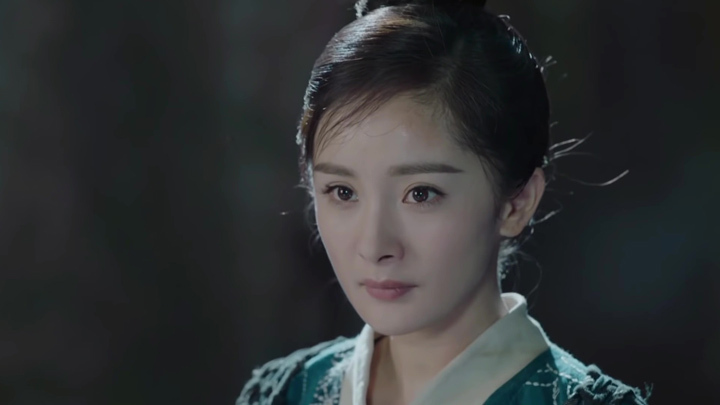 Pei Yuan being the niece of Lord Protector Qi Zhen (revealed in Episode 3), she’s his way towards having that fame and status. After the first episode, it’s looking like Fuyao is the one he does love. Yan Jingchen’s pretty torn when it comes to choosing Fuyao or his ambitions, but every time he presented with the choice of realising his ambitions in life or Fuyao, he always ends up submitting to his ambitions. He does try to make it so that he can have both. 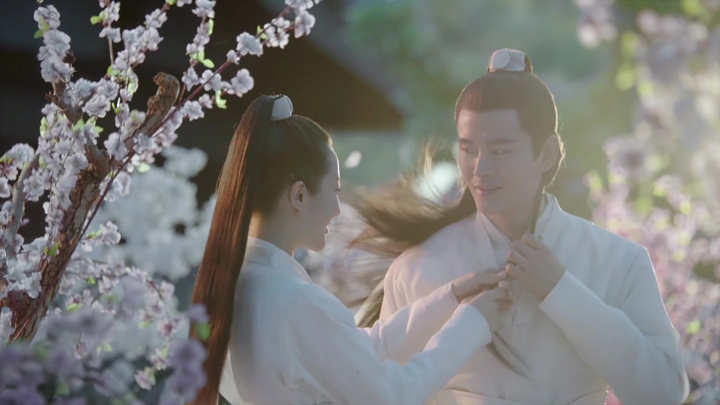 After he is arranged to be married to Pei Yuan in Episode 3, he tells Fuyao that he will make her his second wife. He thinks this is the one way that can work for them both: she’d be able to rid that servant status and have the freedom and life of luxury that he thinks he wants; and he’d have his love and power that he so wants. However, this is not what Fuyao wants. She just wants him to love her wholeheartedly and not have to share it with another person. Everything else, she can work towards herself. Yan Jingchen tries to get her to understand his plans a bit more. He uses their class differences and his father’s disapproval as reasons for having no choice in the matter. He mentions Pei Yuan’s family background, too, saying he couldn’t possibly reject Pei Yuan because of it. When these reasons don’t fly with Fuyao, Yan Jingchen ends with the explanation that is probably the most truthful. He tells Fuyao that marriage was never about deep love between a man and a woman. He is a man with wild ambitions, and when it’s between future prospects and romance, he is left with one choice. That one choice is clearly future prospects. A first look at Xuanyou section on Xuanyuan Mountain (the section Fuyao resides), Mr. Zhou, a butler, shows a young boy around. He briefs him on the Xuanyuan clan and its class divisions. Through this induction, we learn about the Xuanyuan Clan being a large clan in the martial arts circle. Two sections exist in the clan: the Xuanzheng section and the Xuanyou section. People in Xuanyou section serve people and they are of the lowest class. He advises the young boy to avoid anyone who doesn’t wear the same clothes as his. 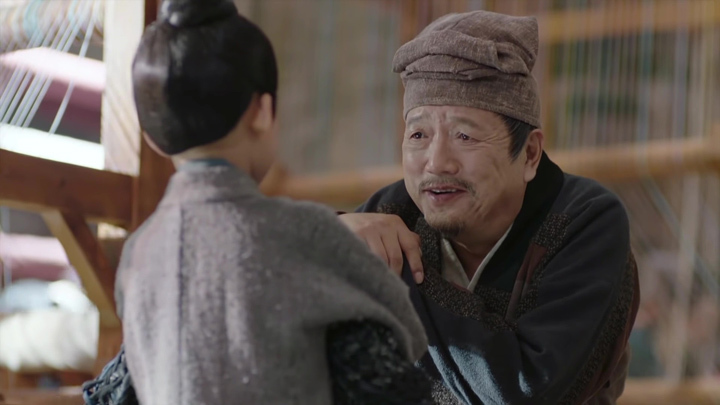 Uncle Zhou tells the young boy not to think about useless things like Fuyao does and just be content with living his life in the Xuanyou section. Mr. Zhou’s words hint at Fuyao’s discontent about being a lowly servant in the Xuanyuan clan. 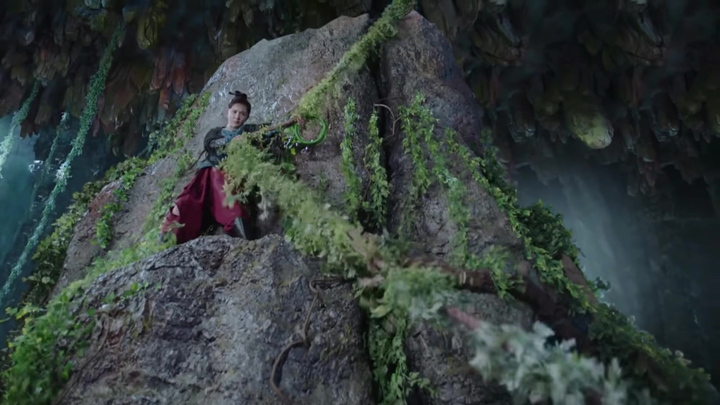 As Mr. Zhou is showing the young servant boy, she’s hanging on a vine on the side of Xuanyou cliff with her friend Xiao Qi (Jiang Long), attempting to climb up to the top to get a look at the sacrificial ritual which precedes the opening of the once-in-eight-year hunting game. 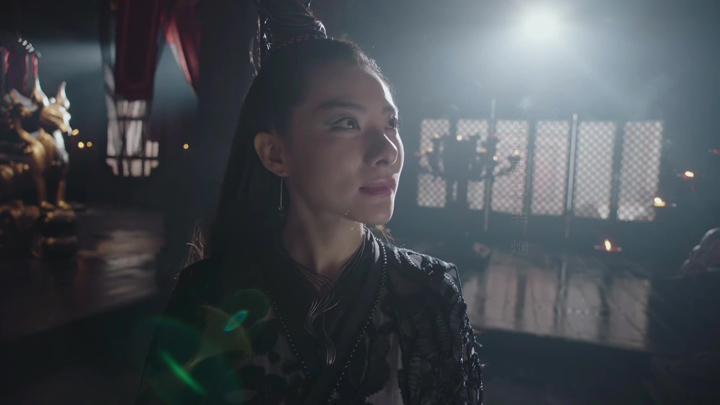 Fuyao appears to have a desire to be able to freely learn martial arts, do what she pleases, go where she wants like the Xuanzheng section can. After she is caught and brought back by Mr. Zhou, she expresses her dissatisfaction over how unfair things are. Not only do they get this freedom, the Xuanzheng section bully the Xuanyou section, and still, the Xuanyou section still have to serve them. Characters and the structure of Xuanyuan clan introduced, Legend of Fuyao move over to introducing one of the main story arcs: antagonist Qi Zhen, Lord Protector, scheming to take out the Xuanyuan Royal Family and ascend the throne. 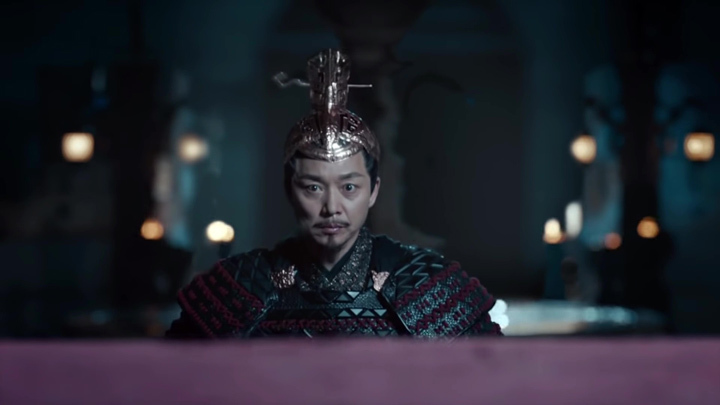 The King of Taiyuan is aware of the Qi Zhen’s desire for the throne and have had Crown Prince arrange for Zhang Henian to station soldiers in the palace and eight guards outside the city to trap him and kill him. 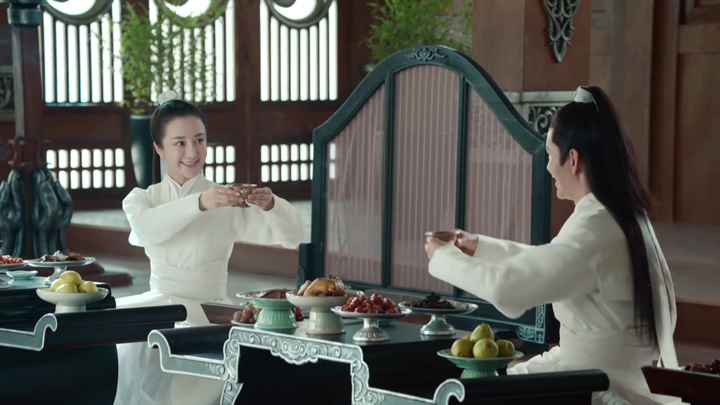 Unknown to the Taiyuan king, Qi Zhen heard the plans through a bowl of water sitting in the middle of the room which seems to be able to transmit the message to Qi Zhen. News of Qi Zhen’s plans to harm the Taiyuan King get back to Yan Lie, leader of the Xuanyuan clan, and Yan Jingchen. It has Yan Jingchen asking whether they could sit back and watch Qi Zhen carry out his plans. 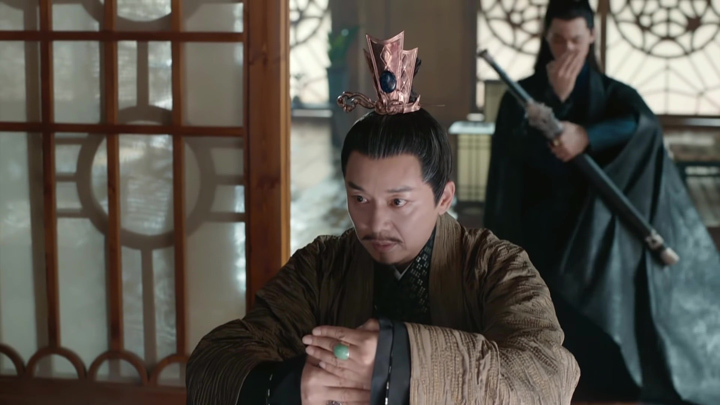 Qi Zhen’s plans to take the throne will bring great turmoil to the five kingdoms has Yan Jingchen feeling uneasy because he had received His Majesty’s graces once. Yan Lie tells his son that doing nothing is the right thing to do. Xuanyuan is far from the political power struggles of the Imperial court and they should indeed remain impartial. There seems to be hints once again that Yan Jingchen is quite occupied with being viewed upon in a positive, high regard by the Taiyuan Kingdom. His father’s advice about doing well in an upcoming hunting game which is held everyone eight years suggest this. As long as he wins this hunting game, no one wouldn’t hold him in high regard. 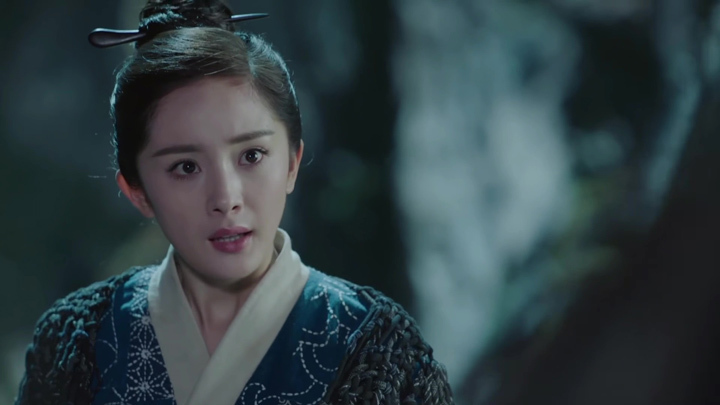 During the night, Qi Zhen invades the palace and stabs the Crown Prince, but only incapacitate the Taiyuan king. His reason for leaving the king alive but unlikely to regain consciousness is so he won’t bear the burden of being the one who killed the king. 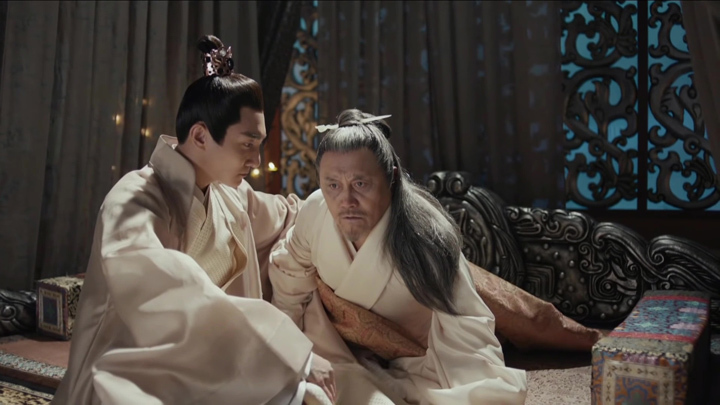 With the Taiyuan King and Crown Prince taken care off, Taiyuan Kingdom’s Prince of Quandu, Xuanyuan Min is left. 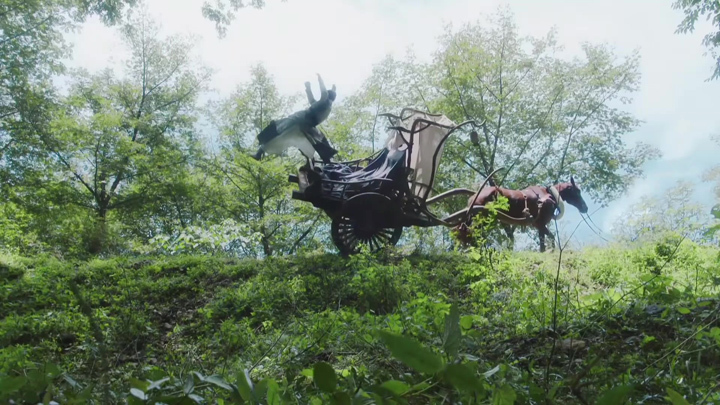 He’s seen running through the woods as he’s chased by half dozen men on horses before coming head on with Fuyao’s wine cart. 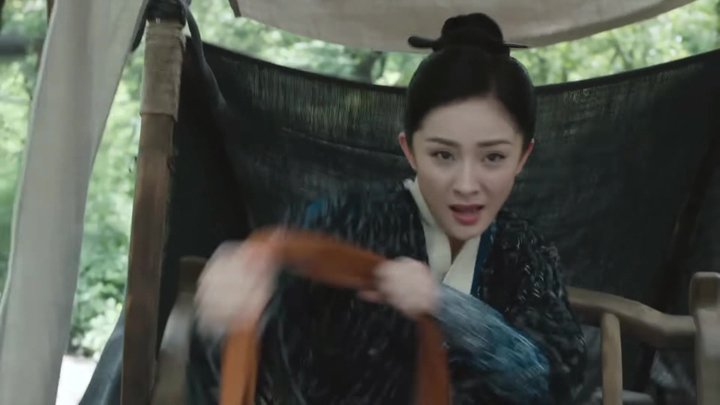 He’s on his way to escaping his pursuers when Fuyao loads the injured Xuanyuan Min on her cart, but Pei Yuan’s little prank to teach her a lesson for sneaking into the secret chamber has her lose the prince: Fuyao leaps out of the cart in order to avoid being shot at with a stone and the prince is flung over the hill as the horse cart crashes. The prince is found and dragged away, but not by his pursuers. Xuanyuan Min is then replaced with another person. The person(s) responsible isn’t revealed in the first episode. 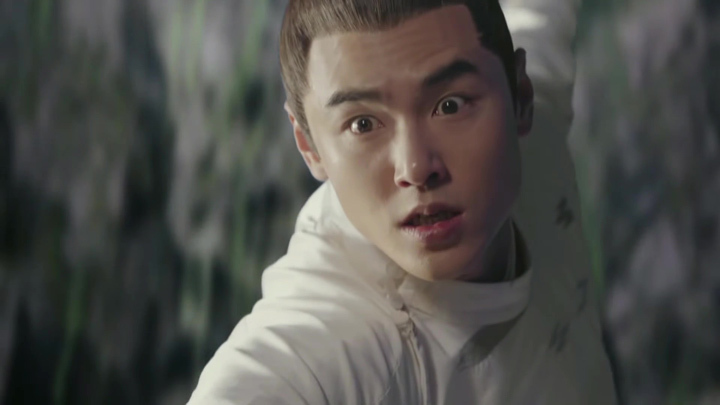 In Episode 2, Zhangsun Wuji (Ethan Juan) is revealed to be behind the intercepted retrieval. 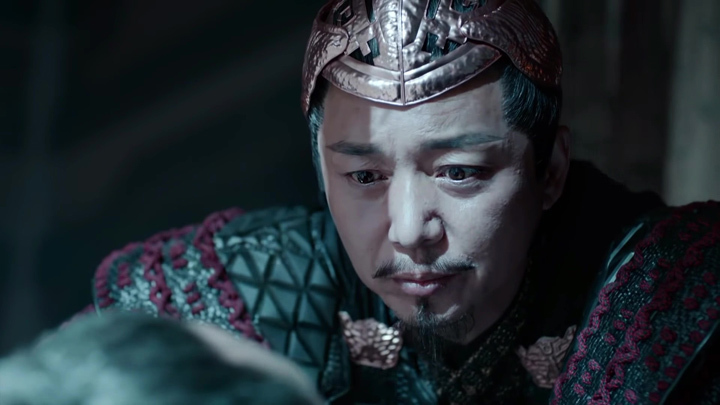 Zhangsun Wuji is the Tianquan Kingdom Prince, the crown prince with the duty of uniting the five kingdoms. Seemingly, though, the appearance of the Xuanyuan Min is not known to Qi Zhen and his people, so the covert switch happens without a hitch. 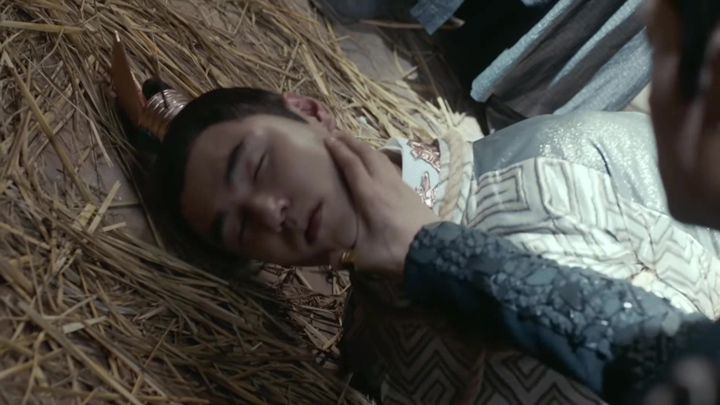 Zhangsun Wuji is taken back to be killed, and is strangled to the point of death (close to death?) as Qi Zhen’s men had been ordered, but Qi Zhen ends up reversing his order. The reason? Because he’s discovered from the Taiyuan king that if the royal family dies off, the Taiyuan kingdom will default on its rule and the kingdom will return to Tianquan Kingdom (Episode 2). This is a condition which all five kingdoms must follow to remain in power. So, it’s not as simple as killing off every member of the royal family and Qi Zhen will be free to take the throne. A second piece of information he learns from the king is that in order to be worthy of the throne, one must be able to manipulate water. We’re not sure if we’ve connected the pieces of information correctly, but the king says that once the royal family dies off, it becomes a flood zone. This seems to suggest the need to manipulate water in order to control the flow of water. With this being the case, Qi Zhen orders Xuanyuan Min to be kept alive. 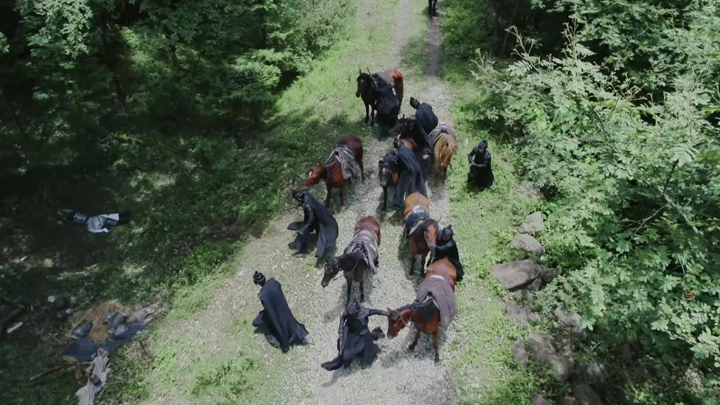 This leads the men and Qi Zhen to bring Zhangsun Wuji (fake Xuanyuan Min) to Xuanyuan Mountain to be revived by a divine physician by the name of Zong Yue (Lai Yi). Zong Yue is a famous doctor with seemingly exceptional healing skills. With a singular treatment, Zhangsun Wuji is brought back to health. 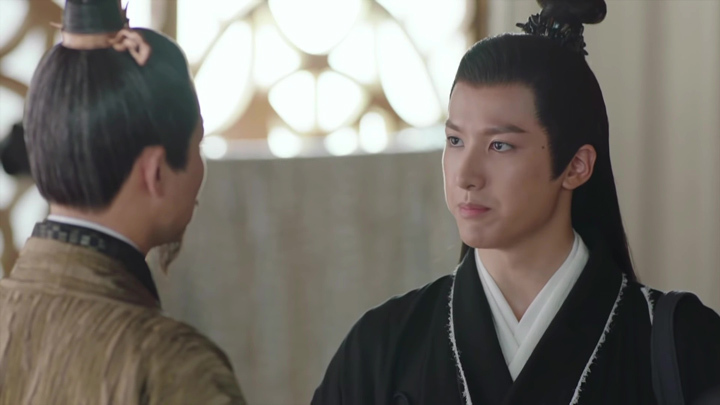 Though it looks like Qi Zhen’s been fooled by Zhangsun Wuji’s switch, Qi Zhen actually carries suspicions over whether Xuanyuan Min is the prince he’s after. 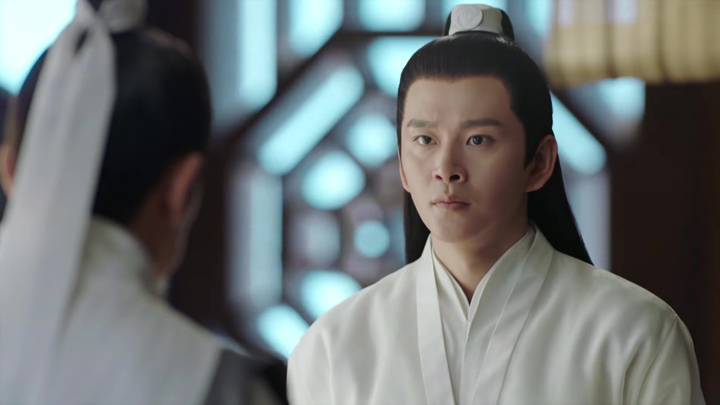 To test Zhangsun Wuji, water is flung at him to see if he can manipulate water as he should be able to if he was Xuanyuan Min. Zhangsun Wuji successfully manipulates water, rotating his hand a few times before catching the water in his palm and placing it inside a bowl. This technique Zhangsun Wuji used is not the same as the water manipulating technique of the heir apparent of Taiyuan. 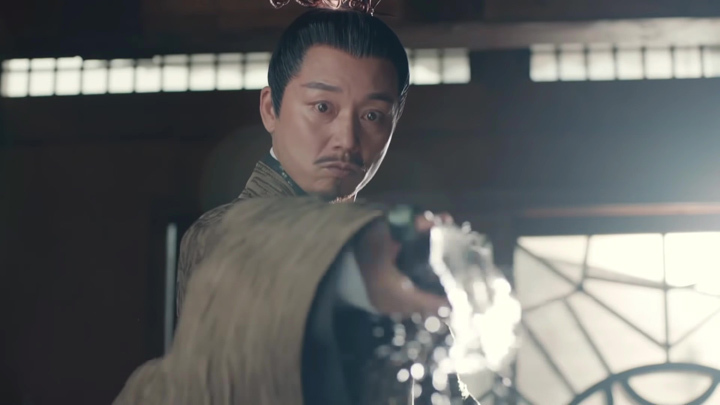 Zhangsun Wuji reveals in Episode 2 that the technique he used is the Firmament technique which is made to resemble the water manipulation technique. Through the help of divine physician Zong Yue (they’re working together to fool Qi Zhen it seems!) and an orchid known as the Baizhi Orchid, it can enhance superficial results of the technique, enough to fool Qi Zhen. Indeed it does. 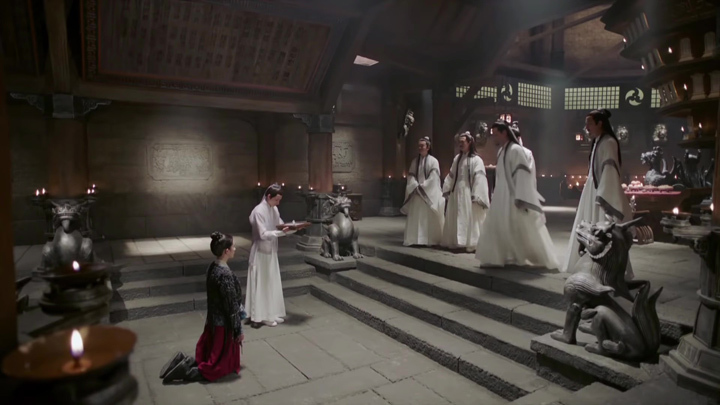 The sight satisfied Qi Zhen and Zhangsun Wuji is greeted as Xuanyuan Min, the new heir apparent who will succeed the king. This yielding and recognition of Xuanyuan Min as the heir apparent is only temporary. It looks like Qi Zhen plans to keep the prince alive long enough to learn the water manipulation technique and take the throne. 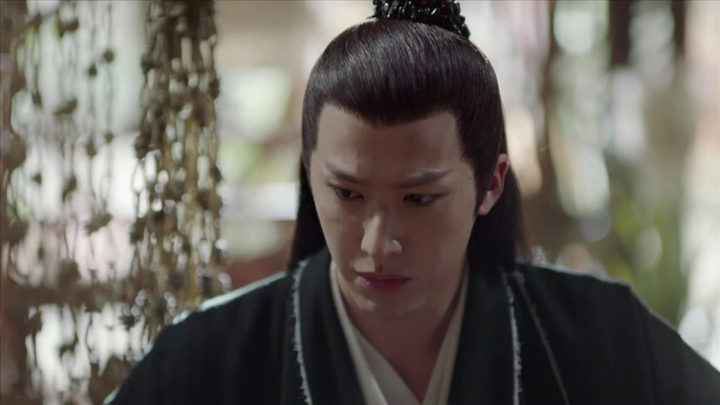 Qi Zhen’s schemes are apparently not lost on Zhangsun Wuji and have chosen to act like a foolish prince as to keep himself off Qi Zhen’s radar and allow him to monitor the situation (at least that’s what we’re thinking Zhangsun Wuji is doing). We can’t forget that Fuyao also knows Zhangsun Wuji isn’t Xuanyuan Min. 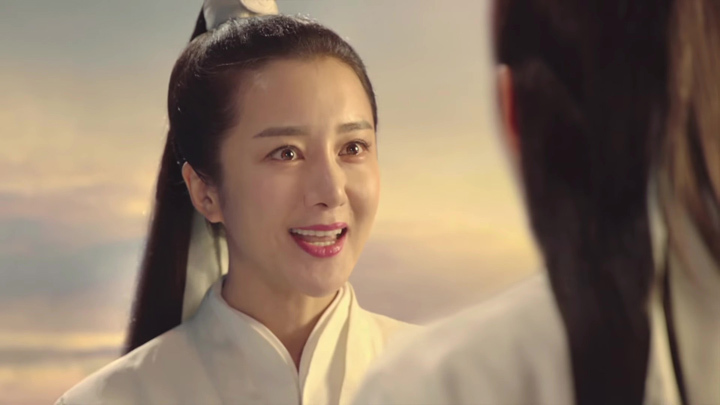 She doesn’t know who he truly is, but because it was her who had loaded the real Xuanyuan Min onto her wine cart (Episode 1), she knows Zhangsun Wuji is not the heir apparent. 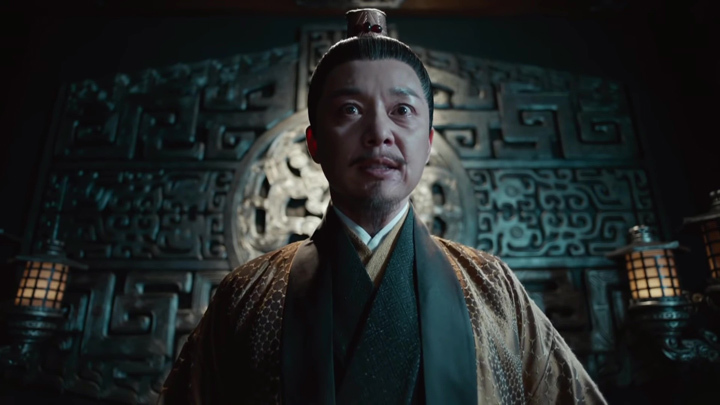 Fuyao is no threat to Zhangsun Wuji, though. 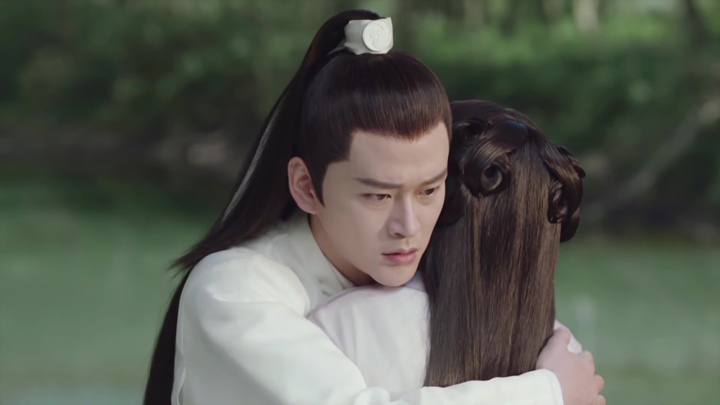 Despite their first meeting being one which saw the two try out-fight each other for the Baizi orchid (she needed it to save her friend’s pig) and Fuyao being wrapped in vines in the end, Fuyao doesn’t hold any hard feelings towards him (Episode 2). 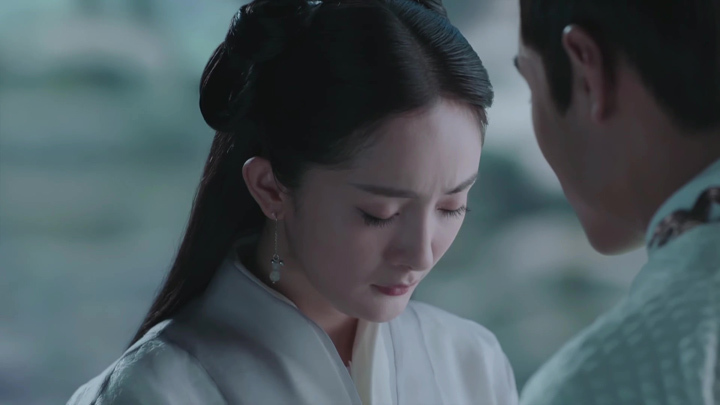 During their second meeting, Fuyao could have revealed Zhangsun Wuji’s act in front of everyone during a banquet (an event which included Qi Zhen, Master Yan Lie, Yan Jingchen and Pei Yuan), she stayed quiet. In a private meeting between the two she agreed to Zhangsun Wuji’s proposal to just not provoke each other and let things be (Episode 2). 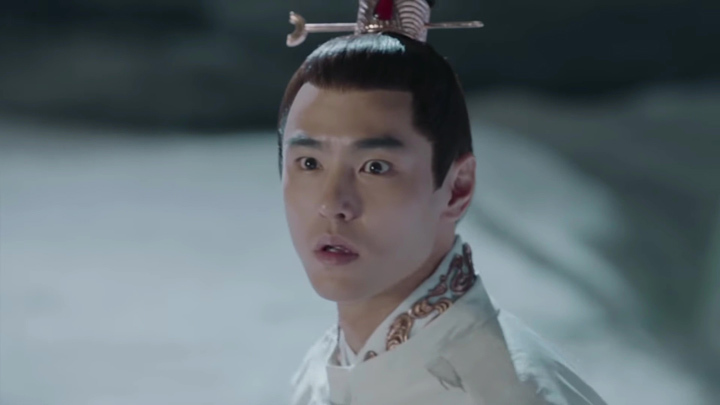 Zhangsun Wuji interested in Fuyao? 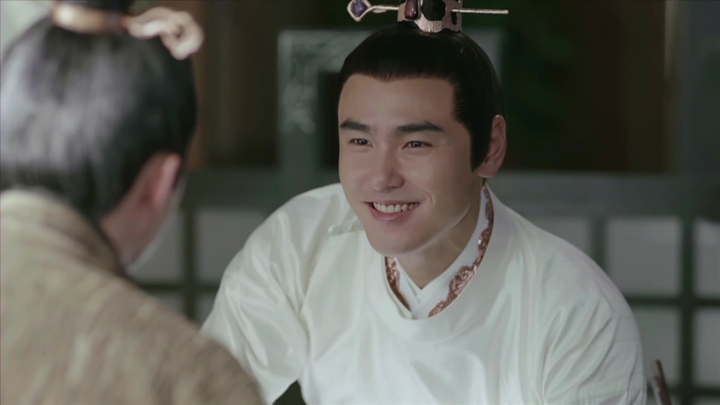 With just two meetings, Zhangsun Wuji’s already showing interest in Fuyao. Apparently, being a part of the Xuanyuan clan, irrespective of the fact she’s just a servant, Zhangsun Wuji should have gotten rid of her in order to safeguard his identity. However, he let her be, expressing he found her interesting. This is very unlike Zhangsun Wuji according to Zong Yue. 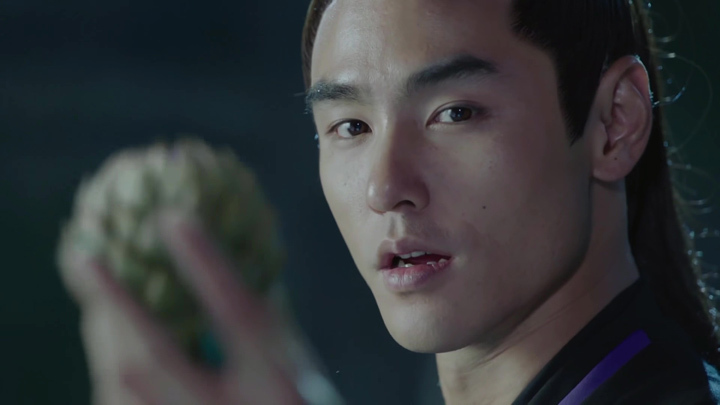 Not only did he let her be, Zhangsun Wuji gave away a potion (called the Immortal Dew) Zong Yue made from 36 unique types of flowers for the pig Fuyao wanted to save as a way of compensating for the Baizi Orchid he took from her. 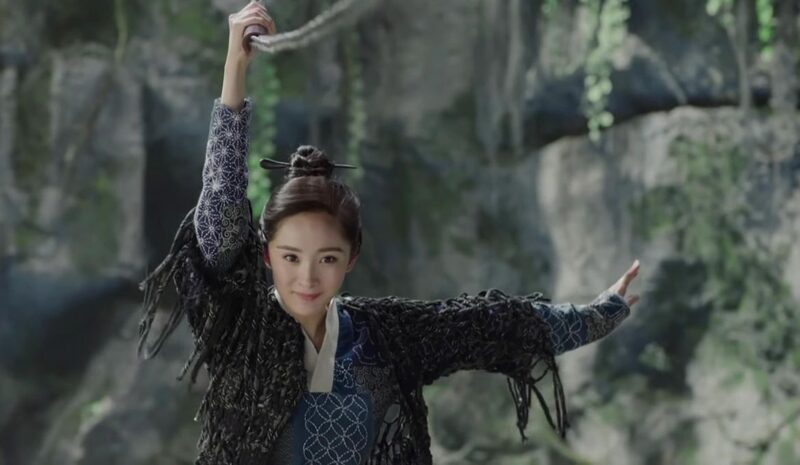 Zhangsun Wuji becomes quite an important part to Fuyao getting through a couple of the rounds in the once-in-eight-year hunting game. This event was introduced in Episode 1, but doesn’t make a feature until Episode 3 onwards. It’s a martial arts event held to select the bravest disciple to help the people drive out mountain beasts and take on the honour of Xuanyuan clan and be the pillar of Taiyuan Kingdom. A servant like Fuyao shouldn’t have been able to take part, since she’s not even eligible to train in martial arts. But, without her knowledge, she’s registered. One night, someone snuck into her room and took the bit of blood from Fuyao that is required to complete the registration. 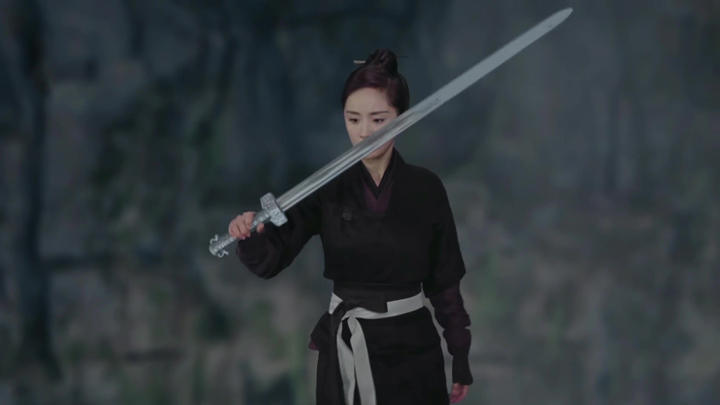 The identity of the person who registered her isn’t known, but it comes after a scene which has Pei Yuan visit Master Yan Lie wanting to rid of her. The insinuation is the hunting game is the perfect way to get rid of her. 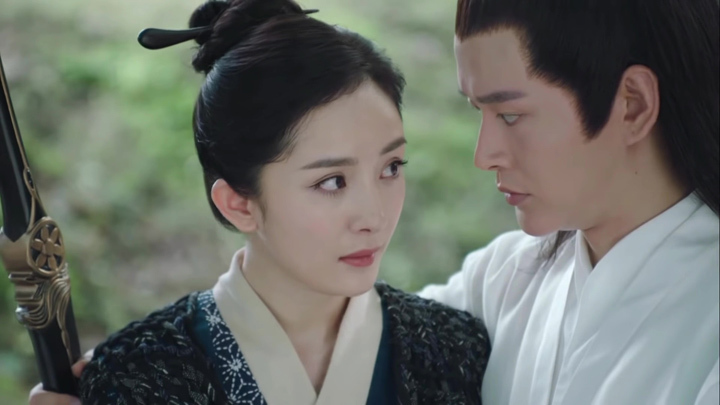 Master Yan Lie seems to be all for it as he has been trying to get Yan Jingchen to forget about Fuyao and focus on his future and the alliance through marriage with Pei Yuan. 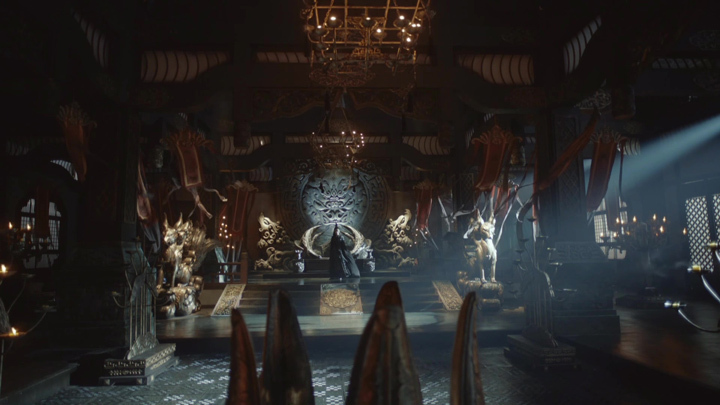 Round 1, which spans two episodes (Episodes 3 and 4), doesn’t go as they hope as the task of subduing the mystical beast happens to be a task Fuyao and Zhangsun Wuji had already managed to do when they came face to face with it just before the hunting game’s opening. 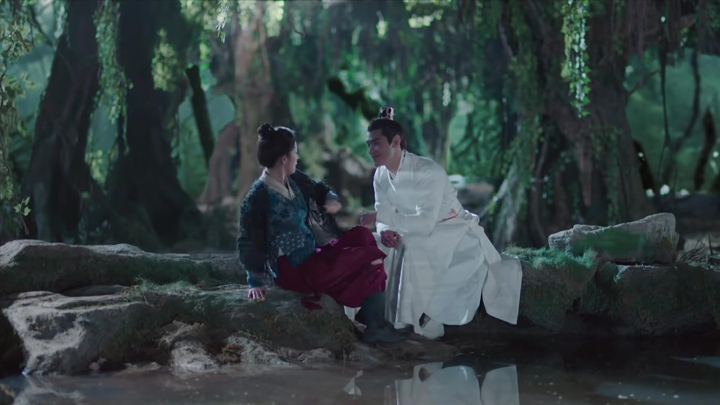 In Episode 2, Fuyao had walked off to a swampy area to be alone after seeing Yan Jingchen and Pei Yuan together. Zhangsun Wuji had followed her wanting some kind of conclusion to the matter of her discovering his act. She thinks he’s looking to kill her, so she offers him the chance then and there. Since she’s become such a hindrance to important people like him and Yan Jingchen, she will just let Zhangsun Wuji get rid of her. Zhangsun Wuji don’t seem to be after that. 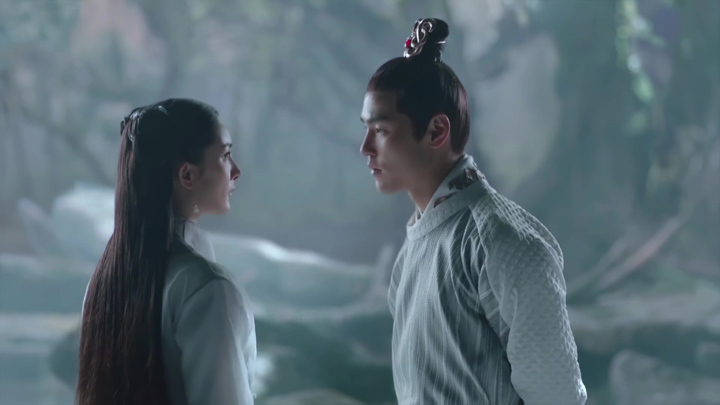 What he’s after, we don’t find out as soon after closing the distance between him and Fuyao, his gaze is drawn to the mystical beast emerging from the waters to the right of him. Off they run. The beast is big and heavy-looking, but it’s fast. 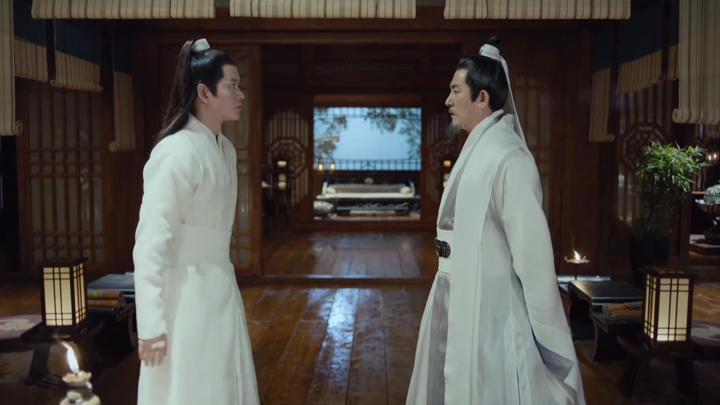 It can catch up to the strides of both Zhangsun Wuji and Fuyao, so running from it is no option. 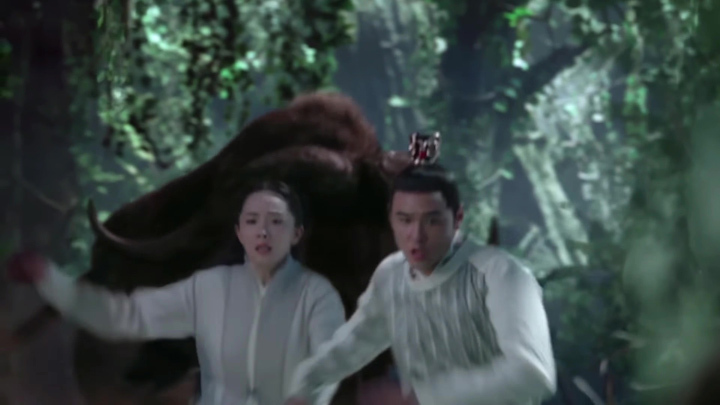 Zhangsun Wuji had managed to escape being pummelled against a tree by leaping up and rebounding off the trunk of the tree to land behind the beast, but gets whipped and flung away by the beast’s long, thick tail. 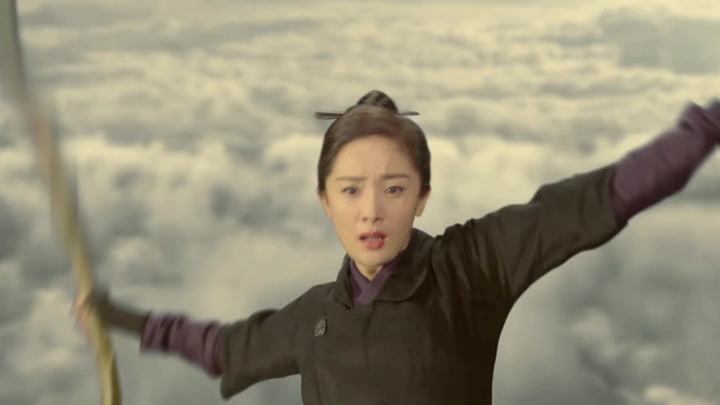 Fuyao’s attempt to lure the beast away from Zhangsun Wuji ends with her being flung into the air and flung away like a rag doll. 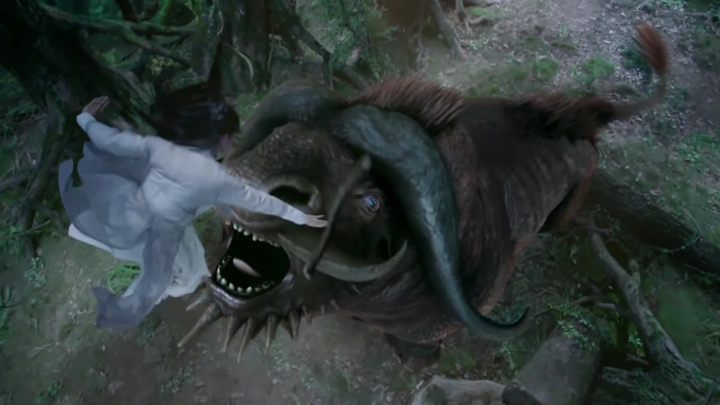 Before being flung away, she had tried throwing a log at the beast’s eye then ride the animal, but couldn’t hang on. Running away, blinding the beast or attacking from behind, none of it worked. It seems a punch in the beast’s Ming-men acupressure point is the key to control the beast. 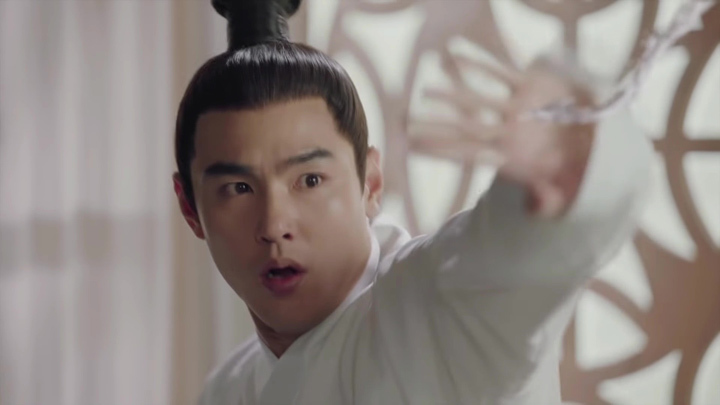 After Fuyao’s unsuccessful attempt, Zhangsun Wuji takes his turn to attack again. He flies past her and lands a punch and a kick between the horns, knocking the beast out. 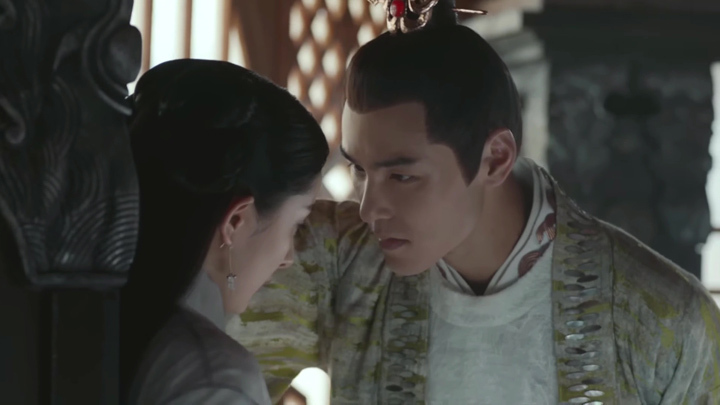 With that Zhangsun Wuji either wittingly or unwittingly teaches Fuyao how to subdue the beast. 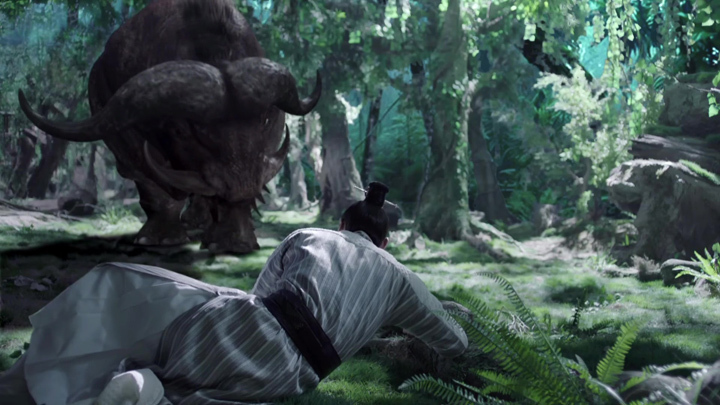 Come time for Round 1 of Hunting Game, Fuyao is more than capable of being on one of the two teams to handle the beast. However, with the participants not knowing just how useful she is in getting whoever team she ends up in past the first round, no one was willing to have her on the team. Fuyao is left with no choice but to announce that she’d be on her own team. This suggestion has elder opening the round reject it. He doubt she’d make it out alive on her own. Yan Jingchen steps in at this point to take her on his team, the Green Team. Naturally, Pei Yuan isn’t happy about it. Leave aside that Yan Jingchen once again went and saved Fuyao, Pei Yuan (and the rest of the team) sees Fuyao as a hindrance to Yan Jingchen and the team. She suggests to leave her behind and have her wait somewhere since it won’t make a difference whether she is with them or not. If only they knew ahead of time how much of a difference Fuyao made to coming out battered and bruise and winning the round they be all wanting her on her team. Actually, thinking about it again, with how much they look down on Fuyao, they might still not want her on the team. They probably rather lose than let a servant help them win. All inside the cave, not one trained martial art students had an answer to the speed and strength of the mystical beast known as Ci-tie. 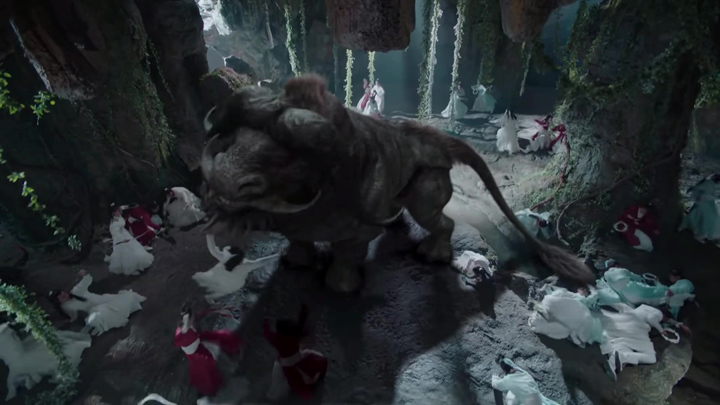 Even before either team could attack, the mythical beast had taken out a few by falling rock caused by the beast’s stamp, and many swords were taken away using the beast’s inhale. When the beast finally charges to where everyone is it makes quick work of the majority of them, crushing and flinging them around. 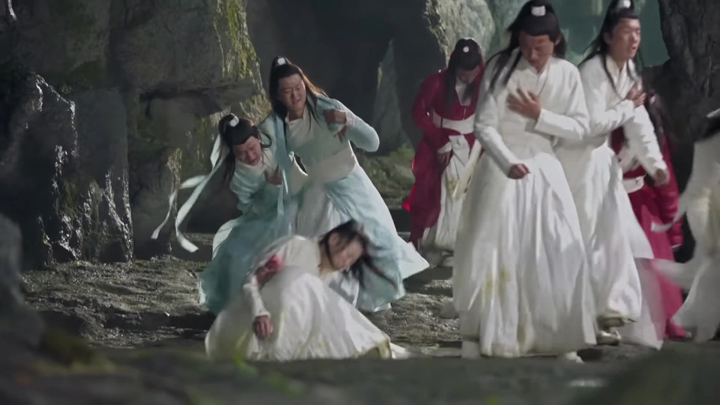 The team without Fuyao on it, the White Team, quickly deteriorate with heavy injuries and any are seen exiting without completing the task of subduing the beast and sealing it. Two of Xuanzheng Section’s best students don’t fear any better. Yan Jingchen and Pei Yuan try to work together to attack at opposites and seal it, but they get flung aside like rag dolls. With even the top students down, the time arrives for Fuyao to show them all how this beast should be taken care of. 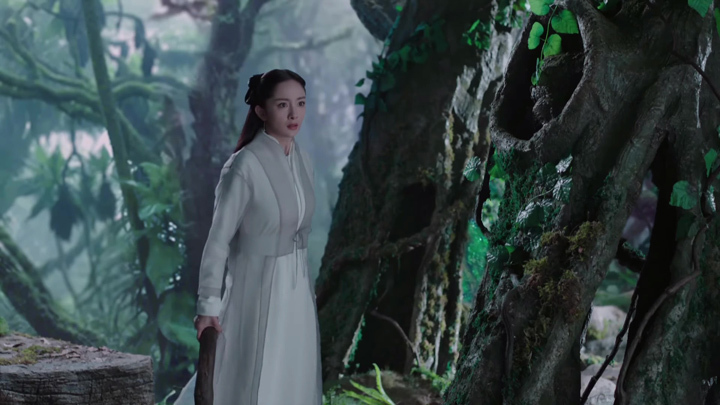 Just like back in the forest, she lures the beast away from Yan Jingchen to a more open area, where there are vines to use and space to run and get into a good position to subdue the beast. She had thought about landing a kick on the beast’s Ming-men acupressure point by swinging down on a vine from the side of the cave, but misses her target. She tries a second time. 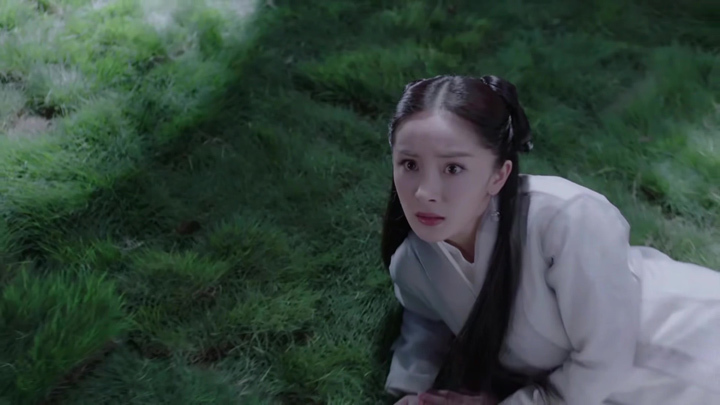 This time, Fuyao wants to land a punch by standing still on the ground as the mythical beast come charging at her (brave girl!). 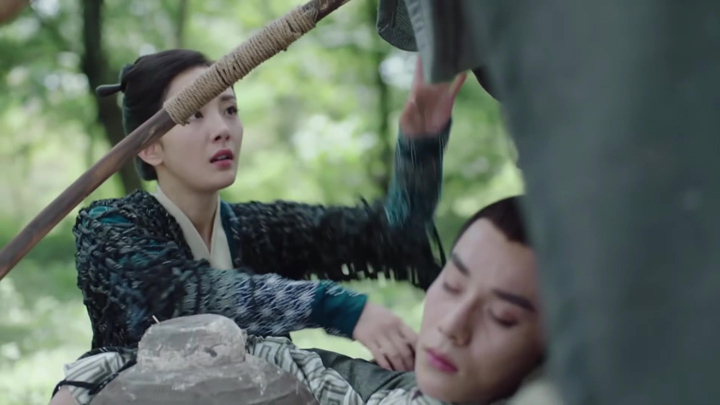 We never get to see whether she would have had the power to subdue the beast this way as Yan Jingchen pushes her out of what he thinks is harm’s way (*facepalm*). 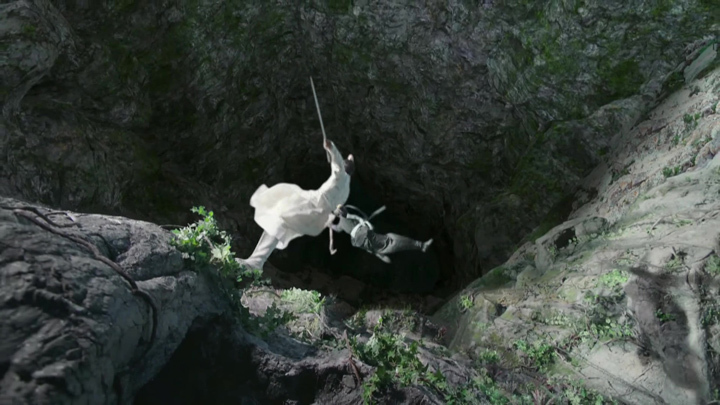 Yan Jingchen sets off to face the beast with his sword, not knowing how ineffective any charging at the beast is, but is halted in his track when Fuyao makes her third and final attempt. 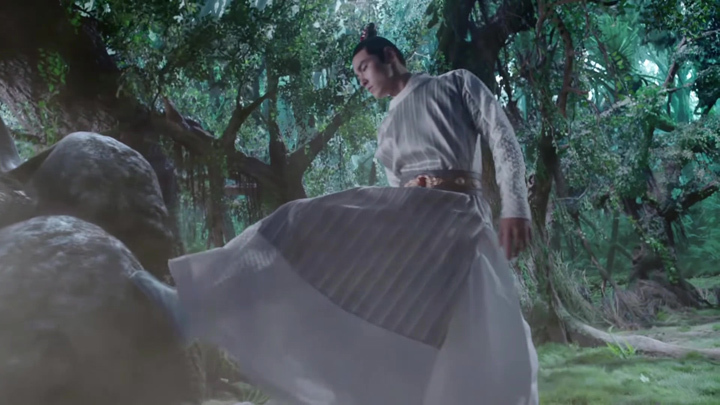 She flings her green sealing ring over the top of the beast before ramping up past Jingchen, using his shoulders for height to land the subduing punch and kick just like Zhangsun Wuji showed her. Fuyao takes out Round 1 for the Green Team. It’s clearly her own victory, but Yan Lie can’t allow a servant to take the glory. 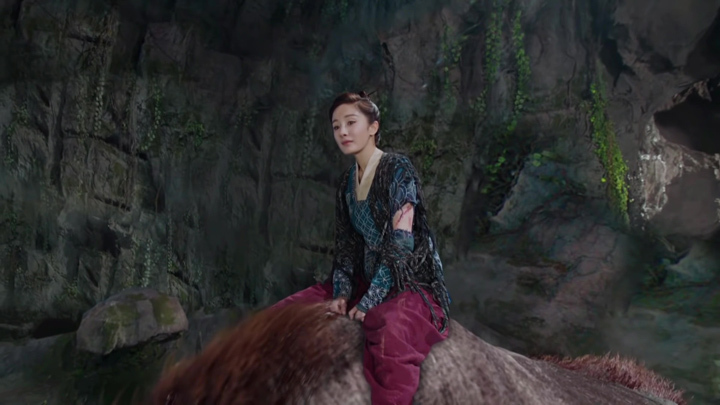 When she proudly rides out on the mythical beast with her worn-down ‘team’, Yan Lie was slow to introduce Fuyao when Qi Zhen asked about her. 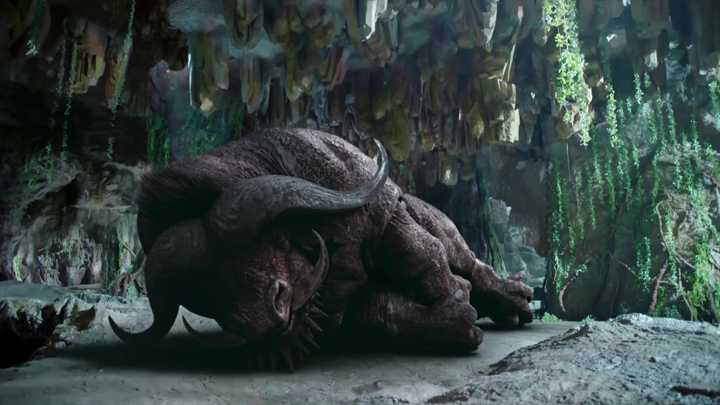 He didn’t seem to want to acknowledge a servant with no martial training could subdue such a beast. Then Zhangsun Wuji deliberately throws in a compliment about Xuanyuan Mountain being full of great talent that even a servant has such great skills. This compliment is of course to draw attention to Fuyao and make sure everyone hears and knows that she tamed the beast when all those Xuanzheng Section martial arts students couldn’t. Before heading to Round 2, Fuyao gets herself into trouble when she is accused of stealing an extremely valuable bottle (Episode 4). 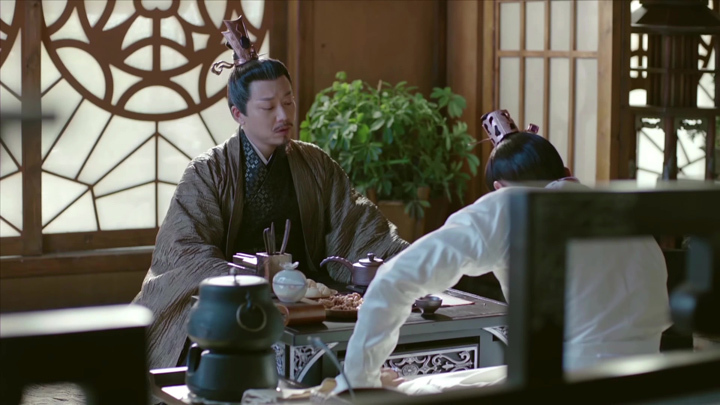 This bottle holds a potion for healing the wound Fuyao sustained from the beast’s poisonous attacks and it was given to her to use by Zhangsun Wuji. Somehow, this bottle gets noticed by Yan Lie sometime after Fuyao visits Yan Jingchen to share the potion with him to heal the wounds he sustained from trying to protect her. Fuyao recalls Zhangsun Wuji’s words about being sensible and to keep her mouth closed if she wants to stay alive. So, when asked about where she got the bottle from, she only tells Yan Lie (and the elders with him) she got it from someone. It only makes them more certain she stole it. Still, unable to determine the truth of her words, she’s sent into the Realm of Nothingness to be judged by the souls of their ancestors. If she makes it out alive, all accusations will be forgotten and she is not to be put in a difficult situation again. 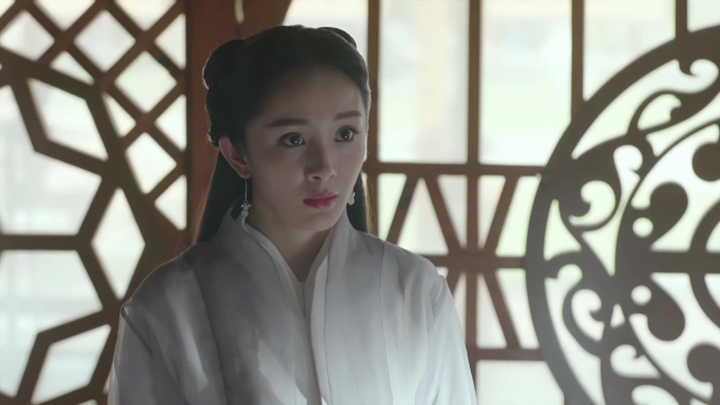 This place is full of traps to overcome and even highly skilled ancestors couldn’t make it out, so everyone is expecting it’ll be Fuyao’s end this time. Not the case. 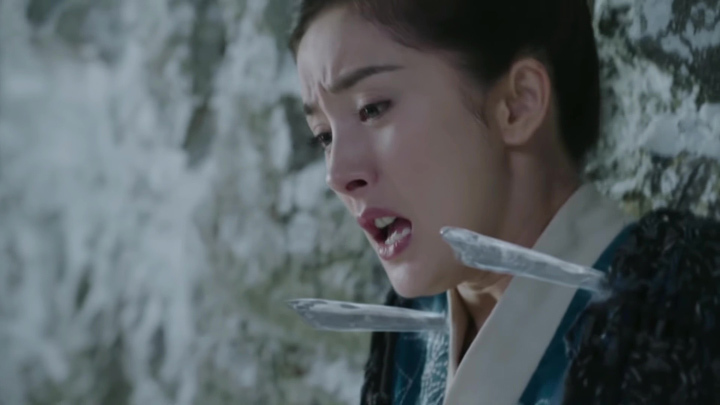 Zhangsun Wuji’s come to her rescue after Fuyao encounters the first trap only moments after being sent into the realm: two icicles fly towards her, piercing her in the shoulders before forcing her against the icy cave wall. She is pinned high up before ice freezes over her. Without Zhangsun Wuji arriving in the nick of time to unfreeze her, she would’ve suffered the same fate as all those before her. But, with his help, she makes it out alive. The fact she had help from Zhangsun Wuji isn’t discovered. A blue light was reported to have been witnessed by one of Pei Yuan’s maids before Fuyao appeared lying on the ground. And so, it is taken that she survived the judgement, and as Zhangsun Wuji says, no one should put her in a difficult position here on in. 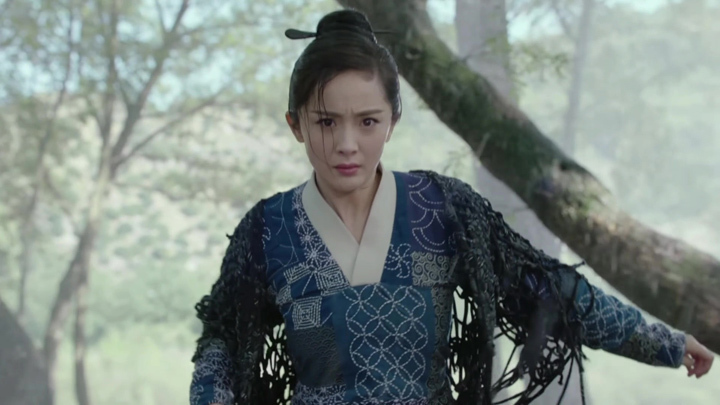 Round 2 of the hunting game opens a couple days after Fuyao recovers (Episodes 4 and 5). It’s another round planned to have Fuyao fail. The round must be accomplished in pairs. The participants choose their own partners or get assigned one if they haven’t paired up, so Fuyao is not disadvantaged. At least not yet. Plans to have her partner ditch her once they head up to the beams in the sky to fight their opponents is where she is expected to fail. Fail, she doesn’t, because Zhangsun Wuji comes to her rescue once again. Fuyao hung off the edge of the beam when Zhangsun Wuji appears to defeat her opponents together with her. 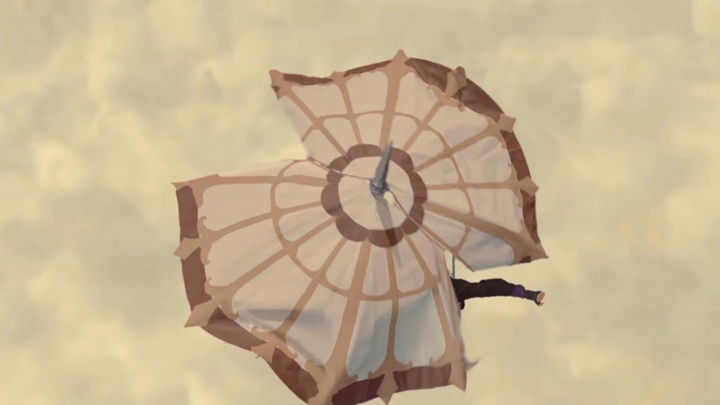 She goes and claim the Longgu Umbrella and they prepare to descend together. 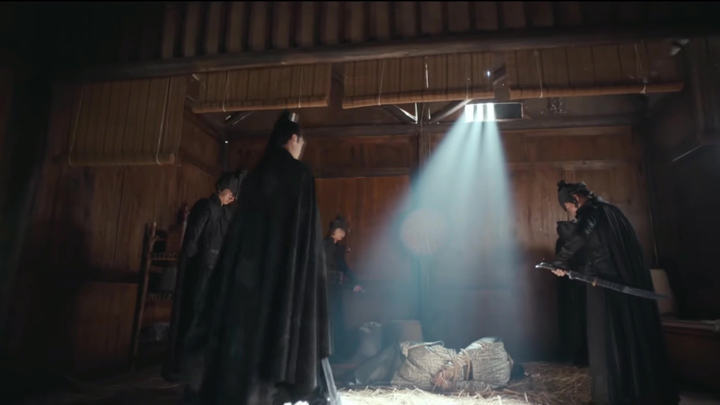 Down on the ground where everyone is spectating the round, black smoke is released from Fuyao’s corresponding dragon on the Dragon Candle. 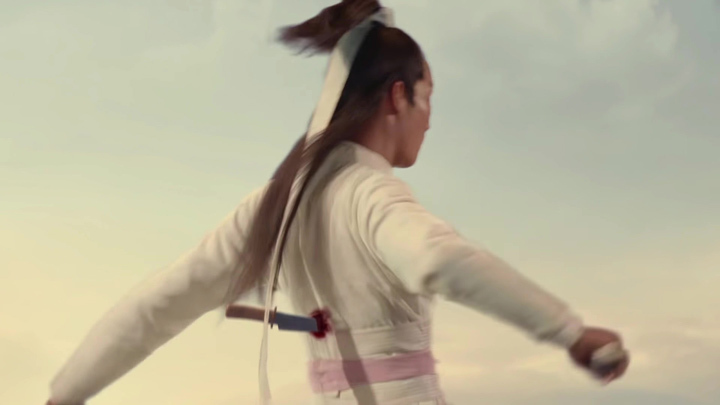 It signifies Fuyao (and Zhangsun Wuji) as having defeated their opponents and is on her way back to ground. However, this black smoke is sucked back in. The Longgu Umbrella has torn. 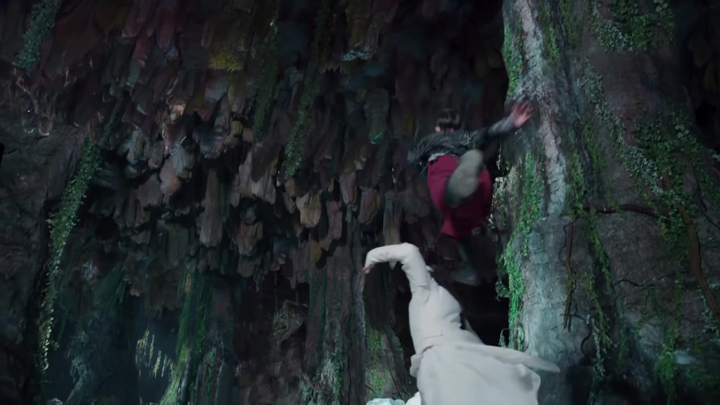 Fuyao and Zhangsun Wuji plummet down the side of a cliff where a body of water situate below them. 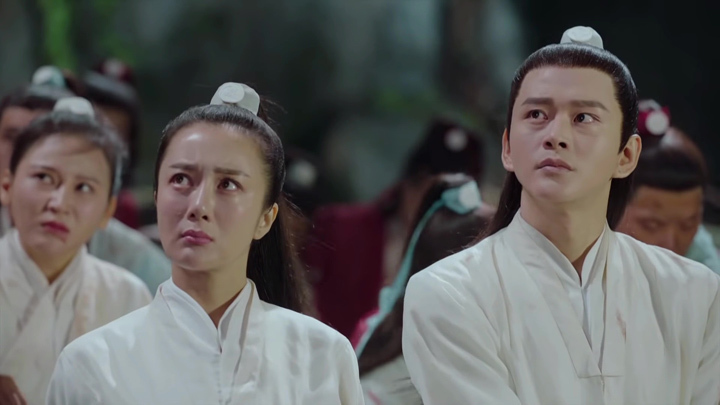 The two get separated when Zhangsun Wuji flings Fuyao away from him. His reason for doing this seems to have to do with the rocky edge he was fast hurdling towards. In order to save her from catching on the rocky edge, he had to direct her away so she wouldn’t hit the edge like he ended up doing. Fuyao fall into the water below her. The fire stick she had been using in the hunting game in place of a sword (an item Mr Zhou gave her before Round 2 began) turns out to be no ordinary item. 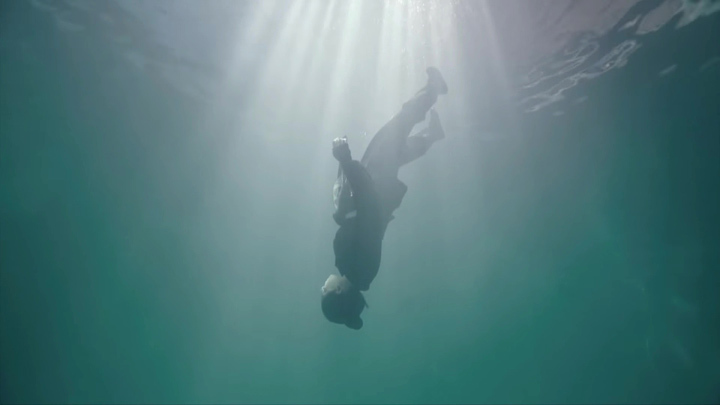 It’s a kind of key to an ancient circle which exist in a cave under the body of water she had been tossed towards. 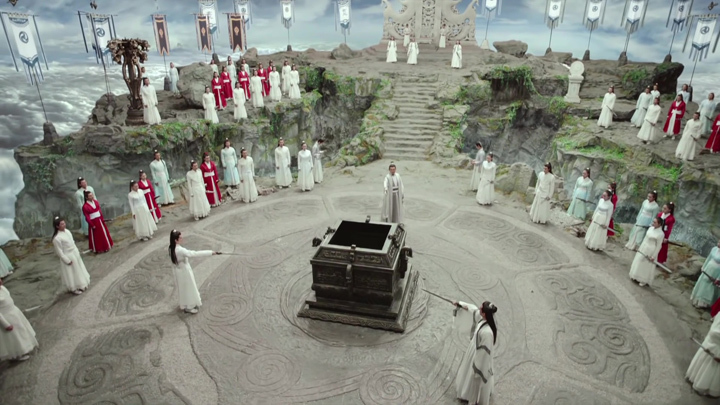 A wide shot of the body of water the fire stick as well as Fuyao had fallen through was possible through a whirlpool that looks to have opened up to receive Fuyao and her fire stick. 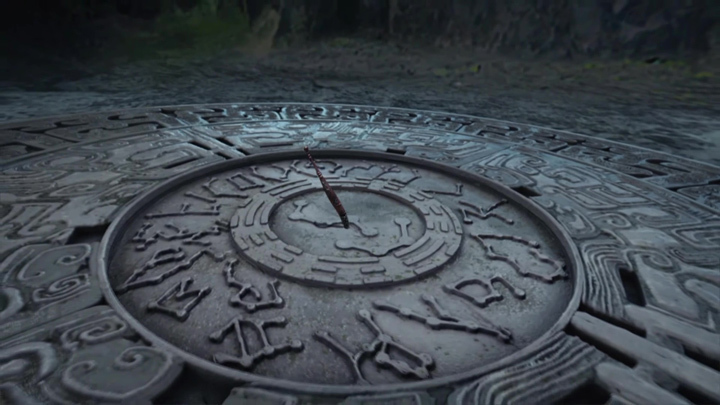 The fire stick connects with the hole in the middle of the ancient circle, turning the circle’s rings before locking in place. Fuyao floats down onto this ancient circle. She wakes. Water forms appear before her. They’re practising martial arts. It looks like she’s asked to practise, too, as a sword suddenly materialise in her hand. And so begins what looks to be the story arc which will see Fuyao play her part in awakening Di Feitian (Episode 5). 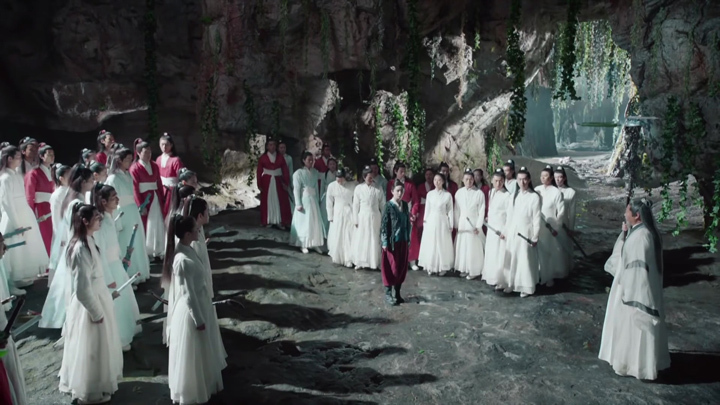 Ancient Firmament’s Lord of Huansheng Temple, Fei Kun, informs us that the girl (apparently Fuyao) with the Five-Coloured Stone has appeared and soon the five kingdoms will be Di Feitian’s. 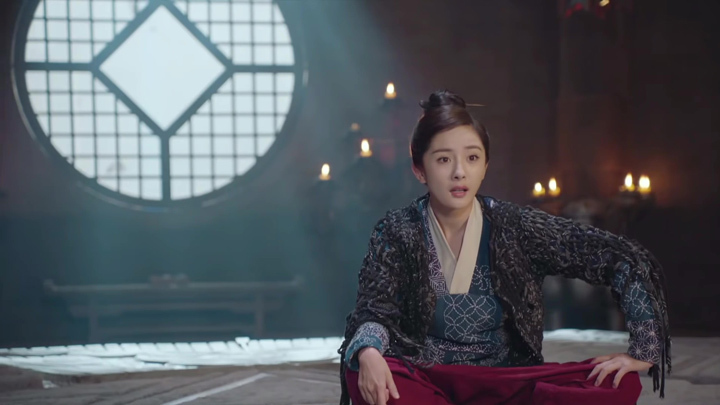 When Fuyao wakes, she complains of a headache and reveals she doesn’t remember much of anything. The last thing she remembers is being in a martial arts fight with Yan Jingchen. 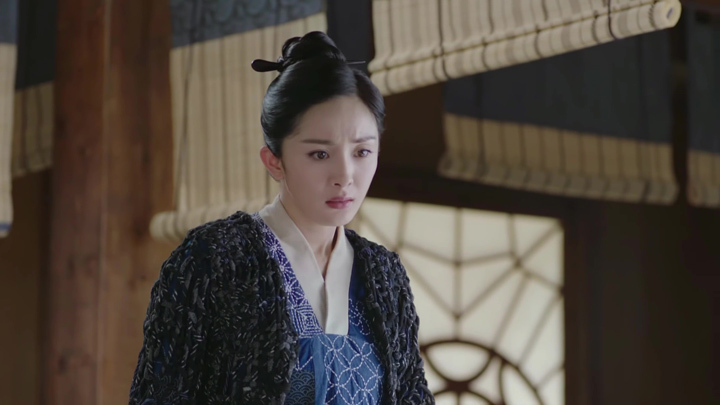 Zhangsun Wuji showing up and helping her in the hunting game, though, she’s not sure about: did he come or was it just a dream? Fuyao goes to see Zhangsun Wuji about it and gets a denial of ever showing up and doing such a thing. It was probably not the best place to get a truthful answer. She had gone straight to his place of stay where he is constantly being watched and listened to by Qi Zhen’s people. Admitting he had gone to the hunting game would mean he lied about disappearing off to the forest to catch crickets whilst the hunting game was on. He had told Qi Zhen that he had no interest in seeing people fight and kill each other when asked about why he didn’t watch the second round. 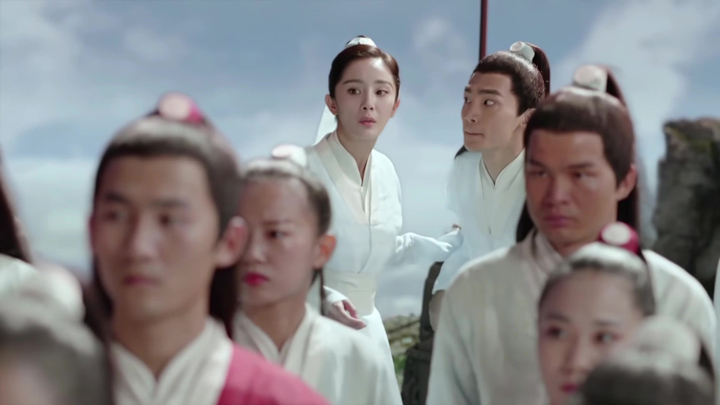 Although it may seem Qi Zhen has been fooled with believing Zhangsun Wuji is Xuanyuan Min, Qi Zhen is still suspicious of whether the heir apparent is as unthreatening as he comes off. Zhangsun Wuji may have deliberately used his interest in a ladybug on a table to express his view on the current situation in a meeting between him and Qi Zhen. 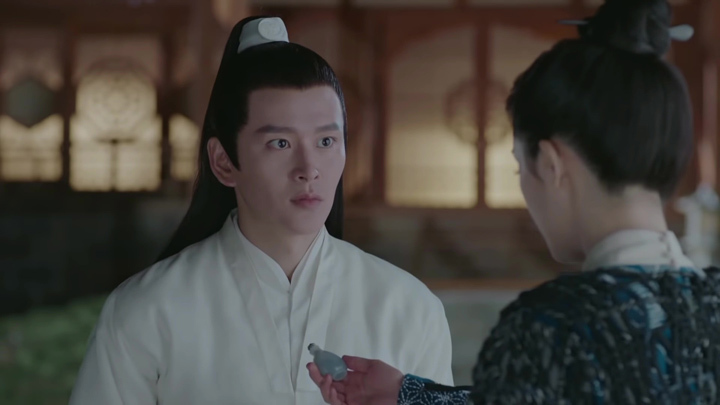 As Qi Zhen is lecturing Zhangsun Wuji about associating with more people in the martial arts circle so he can put them to good use later and paying attention to where his mind is at, Zhangsun Wuji is playing with a ladybug, blocking its path with a finger at every turn. Zhangsun Wuji laughs seeing this, which has Qi Zhen question why he was laughing. Zhangsun Wuji tells him it’s because the ladybug was bumping its head all over the place just because he had blocked his path. Qi Zhen makes nothing of this, but it sounds a lot like he was comparing the ladybug to Qi Zhen. Zhangsun Wuji doesn’t stop there. 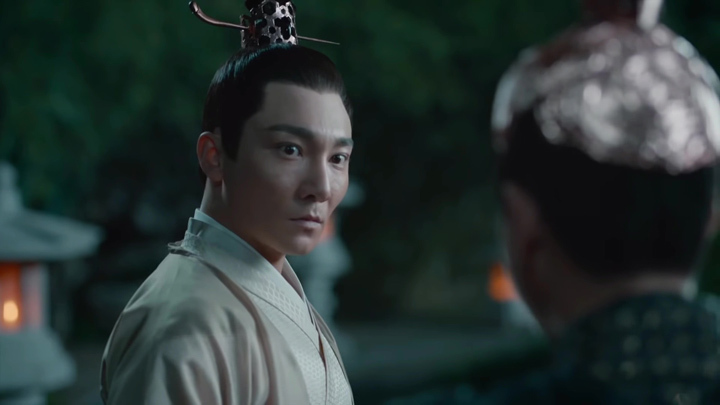 Through a story about ringing the temple bell too many times and voiding all wishes, it seems he’s warning Qi Zhen about his greed and wanting too much. 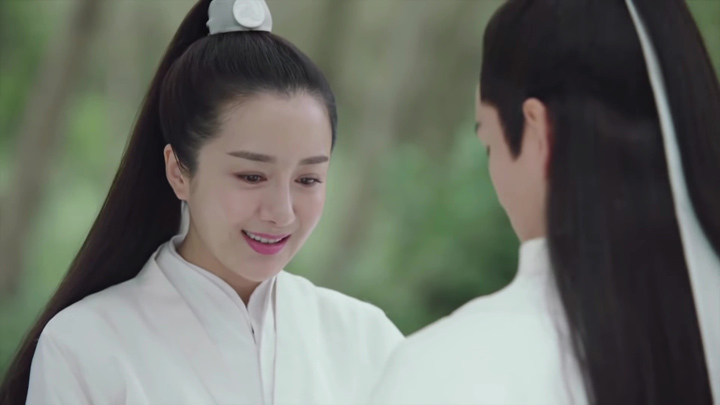 Qi Zhen picks this one up and confronts Zhangsun Wuji about it, but Zhangsun Wuji denies such meaning, telling Qi Zhen that the story was meant to refer to himself. 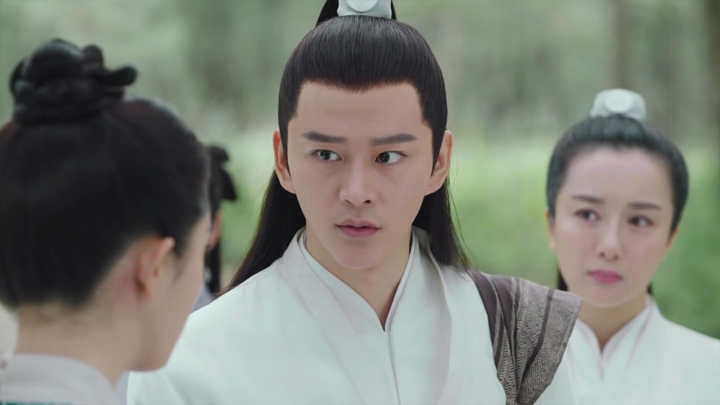 Zhangsun Wuji says it’s he who dares not ask too much, which has Qi Zhen let Zhangsun Wuji know that he will remember the story Zhangsun Wuji told him. What this means is unclear. Going back to the mysteriousness in Fuyao, as well as being a bit muddleheaded on things, she’s falling asleep in one place and waking up in another. As this is happening, she’s made to learn martial arts in the cave during her sleep (or it starts off in her sleep before she is taken to another place to learn martial arts for real without knowing—which explains her waking up in different places). It leaves her so tired and sore during the day that she isn’t able to stay awake. The situation leaves her troubled enough to ask her friend, Xiao Qi, to tie her to her bed, close all her room’s windows and lock the door well so she doesn’t leave the room and end up somewhere else. It’s no help. She still ends up waking in a different place. 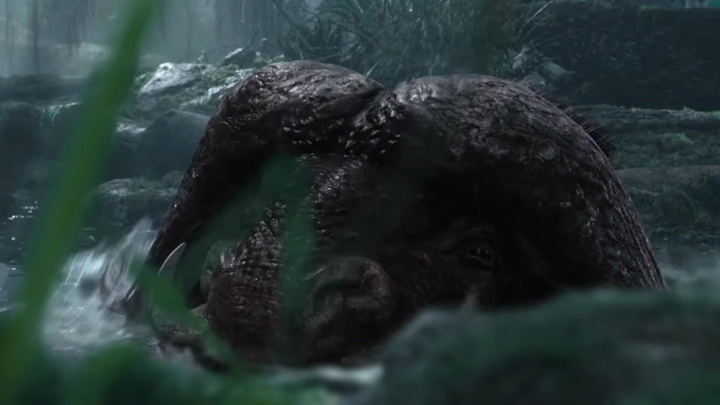 This time it’s outside in the forest and the water forms she encountered in the cave are there, forcing her to fight. From an outsider’s view, these water forms aren’t there, though. 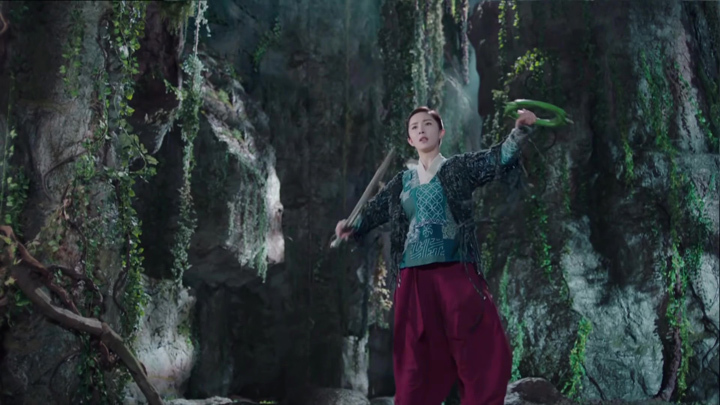 It’s just Fuyao swinging her sword. Zhangsun Wuji, who happened to be there on a stroll smiles at the sight. 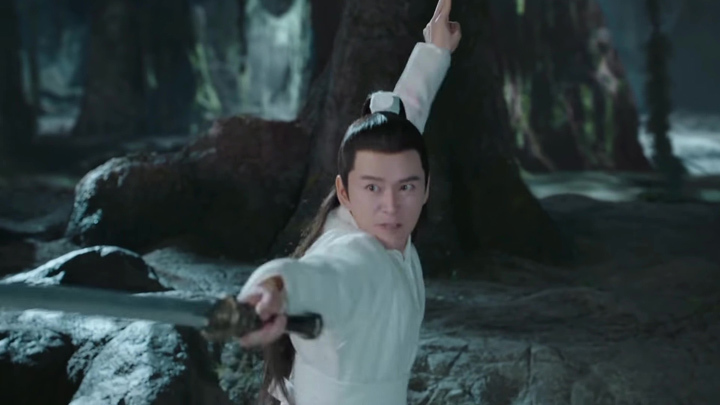 It looks like he thinks Fuyao is there practising some sword skills by herself, but he soon realises that’s not the case. 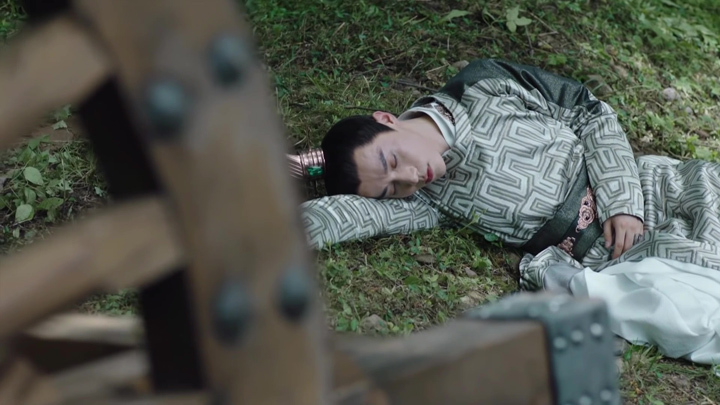 He seems to have picked up on Fuyao’s fatigue and maybe her inability to stop. There’s been talk back at Xuanzheng Section that she might be possessed because of this strange habit of sleeping in one place and waking up in another. Zhangsun Wuji runs over to her to put her to rest through acupressure points, after which has him wonder aloud what was wrong with her. Zhangsun Wuji, who didn’t appear too concerned when he heard about her strange habit back in Xuanzheng Section, is seemingly now worried. One last mystery which closes Episode 5: what happened to the 12th pearl? One of the pearls which are used in the hunting game have gone missing. 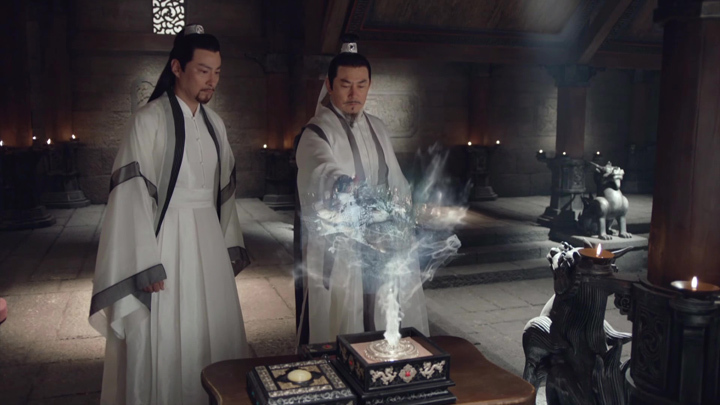 Through a magical box, called the Luque Zhuanyin Box, Yan Lie and one of the elders tracks the pearl to have gone missing at Xuanyou Section, insinuating that someone there has it. Our guess, Fuyao is that someone. This is not a drama where we can look away and still hope we’d be able to follow the story once the eyes are back on the screen. 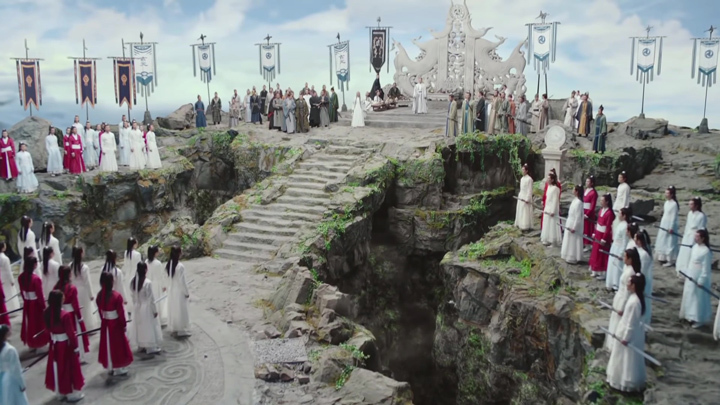 Five kingdoms, a clan with two sections, and 15 or so characters in just five episodes with fake and real identities, it was a bit hard to keep up with. 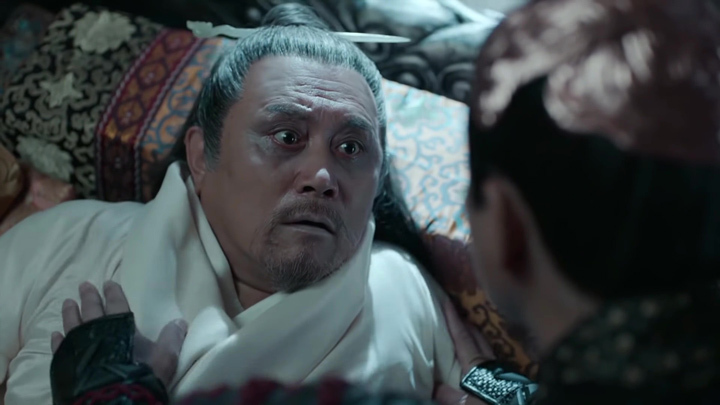 As we mentioned above, we had to rewind a few times because we’d miss that one little dialogue that mentions a person’s name and title (like Zhangsun Wuji is Crown Prince Wuji of Tianquan Kingdom pass mentioned by Zong Yue) or that flash of a scene explaining what had happened (like the switch between Xuanyuan Min and Zhangsun Wuji). Of course, we could have learnt all this information a lot earlier and a lot more easily had we discovered the Chinese version of the drama which actually had the on-screen text introductions of characters. Turns out the version on popular English streaming sites don’t have these on-screen text introductions. Oh well. Anyway, so far, we think the drama is pretty good. We loved Episodes 3 and 4. But, it hasn’t quite grabbed us in a way where we can’t stop and just gotta watch more, more, more. But then, we are just at the beginning of the main story, so it’s probably still building towards the exciting parts and we can see ourselves hanging in there based on what has been developed so far. 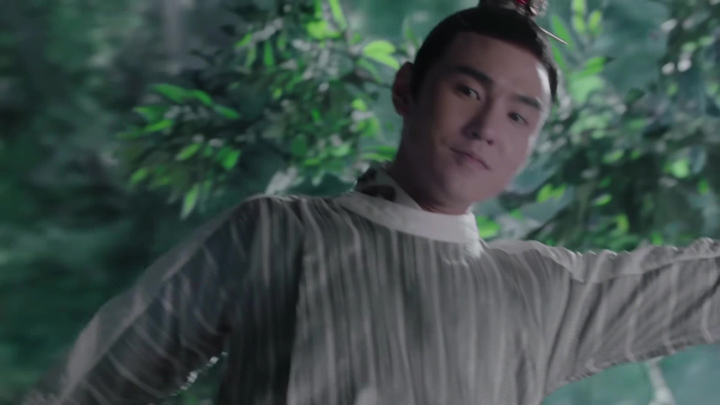 We like the fact that Fuyao is this lowly servant who keeps surprising Yan Lie and all those Xuanzheng disciples in the hunting game and the Wu Nian Realm. It’s true she got help from Zhangsun Wuji, but she’s looking like she has a huge amount of hidden potential. 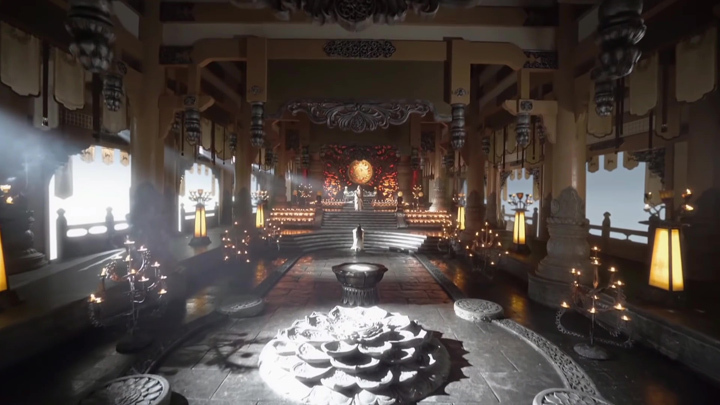 Fuyao almost mastered the levels in the secret chamber in Episode 1. 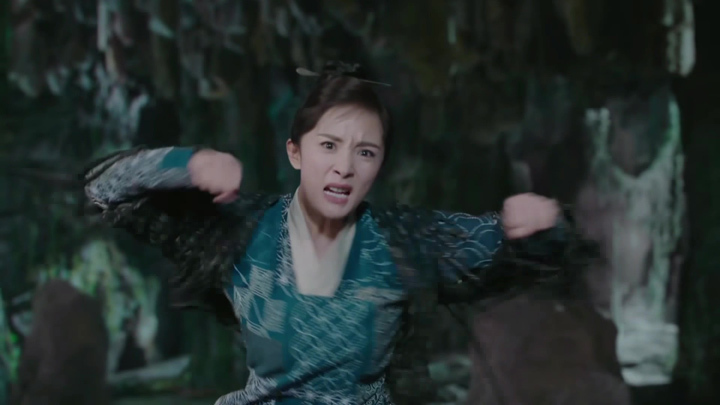 Her punch is as strong as Zhangsun Wuji’s when she subdued the mythical beast during Round 1 in Episode 4. It looks like she’s got some strong internal strength, too. 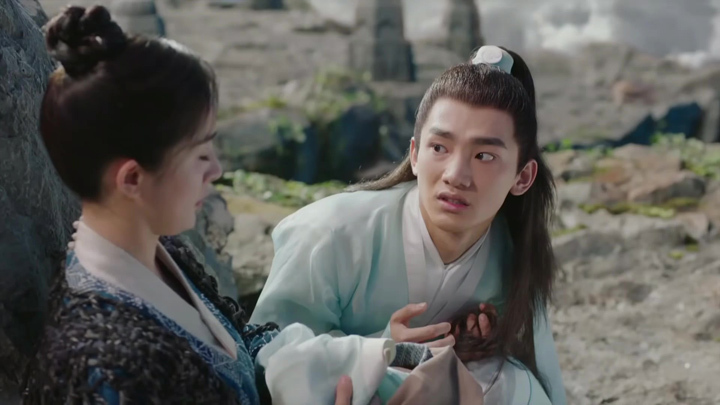 When Zhangsun Wuji went to save Fuyao in the Wunian Realm, he was surprised she was able to survive long enough against the bone-chilling cold (caused by being frozen) to allow him to revive her. This combination of lowly servant with hidden power and potential, it makes us excited to see how she’ll develop later as well as how she’ll be received by people like Yan Lie, Yan Jingchen and Pei Yuan later on. We saw spoiler shots which see her dressed in royal dress, this makes us curious, too. Reading a little about the drama online, Fuyao actually has another identity just like Zhangsun Wuji. Interesting! Another part to look forward to. 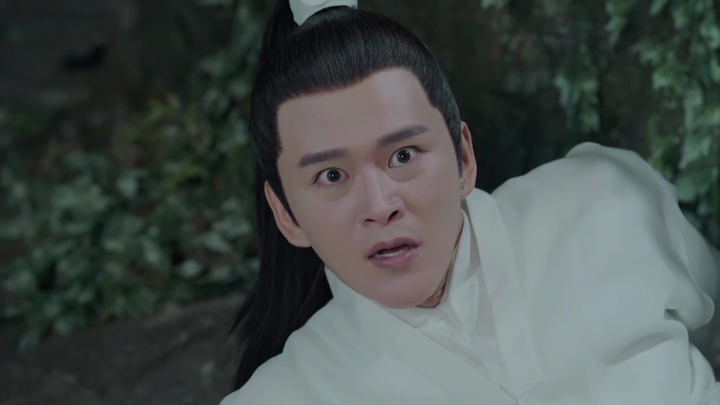 We’re really liking Zhangsun Wuji and how he always shows up just in time to help or save Fuyao. These two might end up clashing at one point, though. The person who’s been chosen by the Mysterious Spirit Leaf hasn’t been revealed, but if our guess of Zhangsun Wuji being that person is right then it means he eventually has to go against Fuyao in order to stop Di Feitian from awakening. What we don’t like? Pei Yuan. She is so merciless. She just doesn’t let off anyone she sees as a competitor. In the hunting game, she unnecessarily used her dagger and her sword against fellow disciples who were just on her team in the previous round. 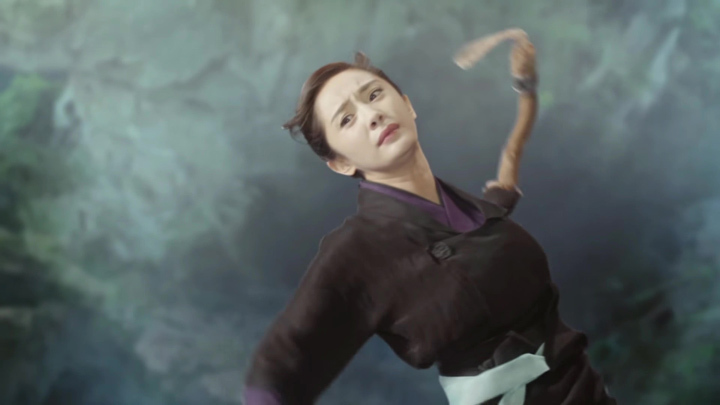 She could have handled her opponents with attacks which disables (like kicks) or use the sword in a way which show she is the clear victor, like how Jingchen held it against his opponent’s neck, but not actually go through with the slashing. She chooses to go the surest and quickest way: dagger to the back then to make sure the opponent doesn’t get back up, a slash of the sword for good measure. This was what she did for one of the opponents Jingchen was fighting. As much as we don’t like her, we still want to see more of her, especially in encounters between her and Fuyao when Fuyao becomes stronger. 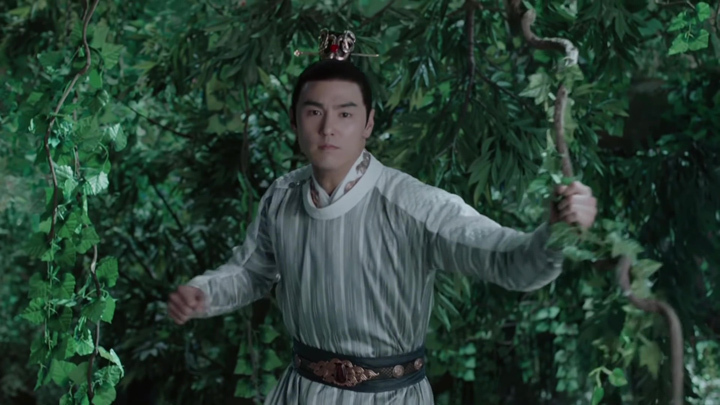 It’s going to be great seeing Fuyao show up Pei Yuan some more, just like in Round 1 of the hunting game. Maybe we’ll get to see a bit of regret from Yan Jingchen for not fighting more for Fuyao. : oP : oP.